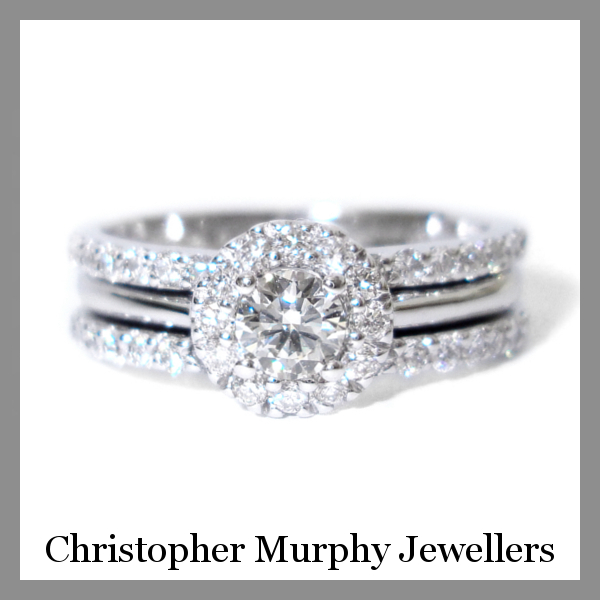 Incorporating your Wedding Ring with your Eternity Ring is now becoming a very interesting option to consider when choosing your band. 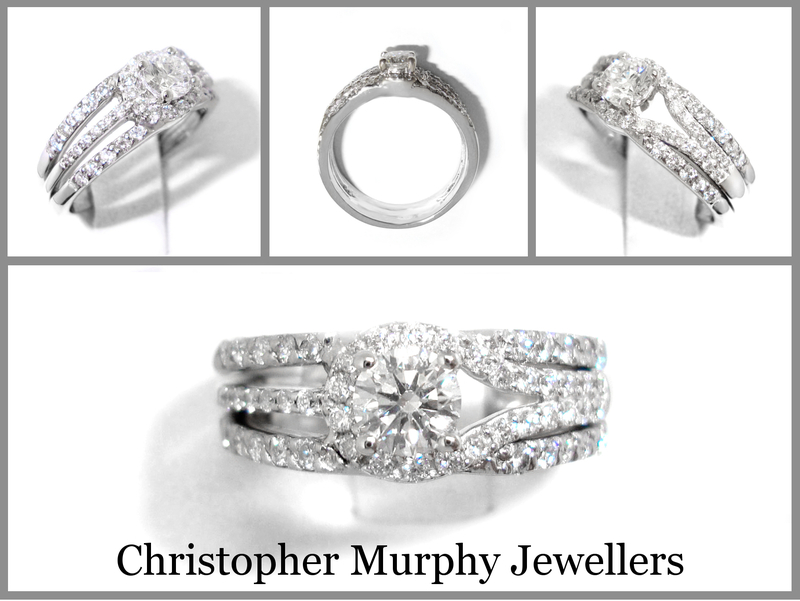 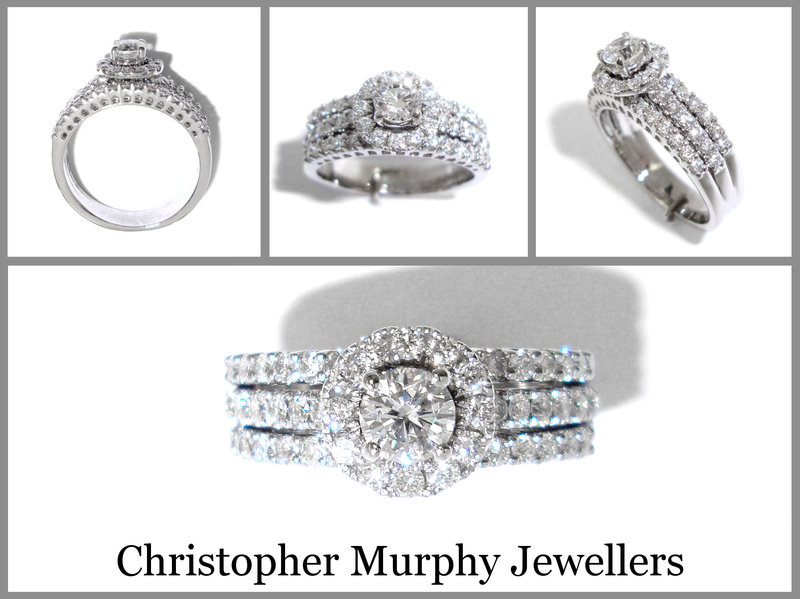 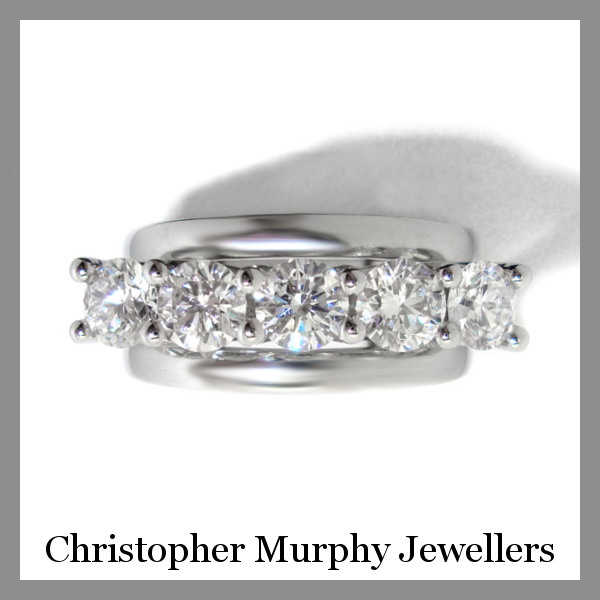 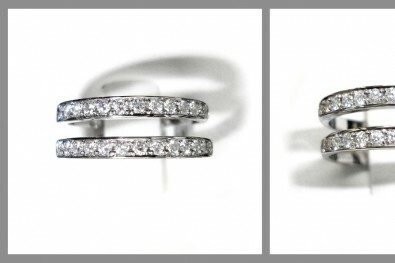 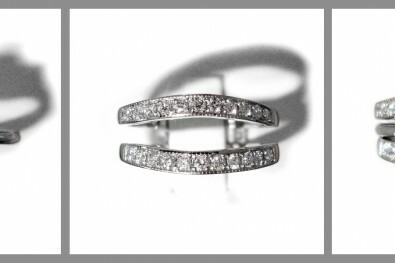 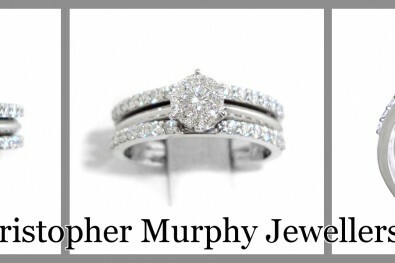 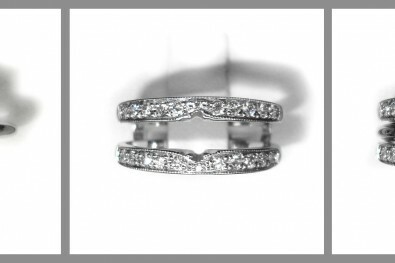 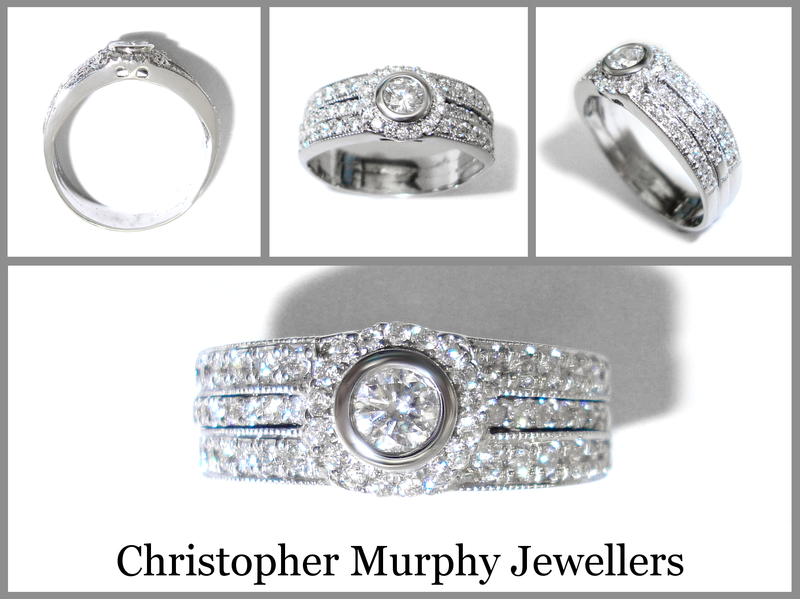 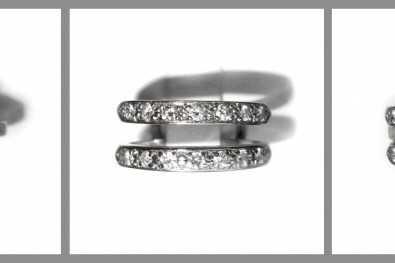 With two rows of diamonds surrounding your engagement ring, the effect gives a real enhancement to your ring and is a great alternative to the traditional individual plain wedding band. 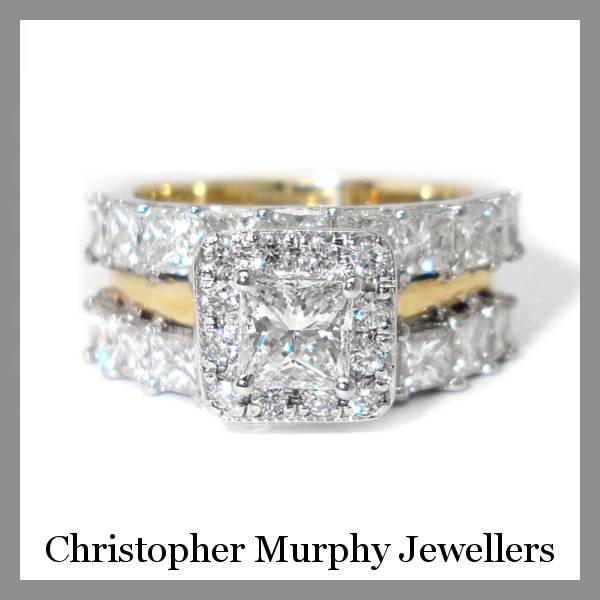 Apart from the fact that they are absolutely fabulous, they support and protect your engagement ring from everyday wear and tear. 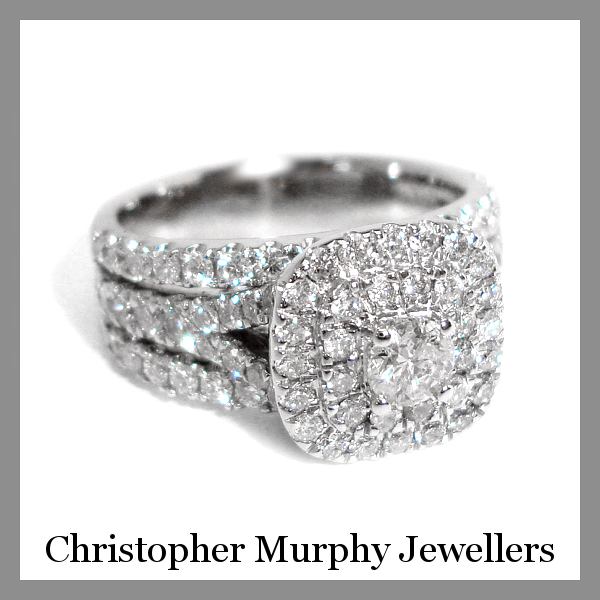 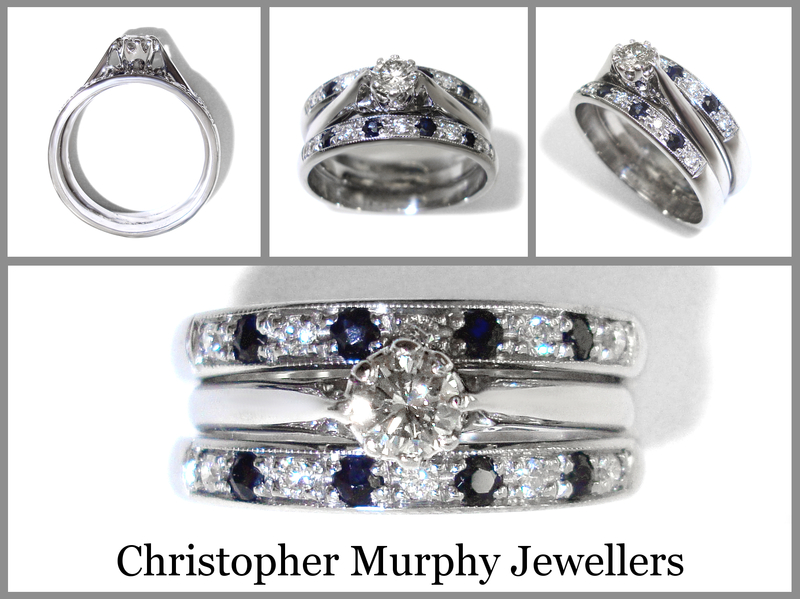 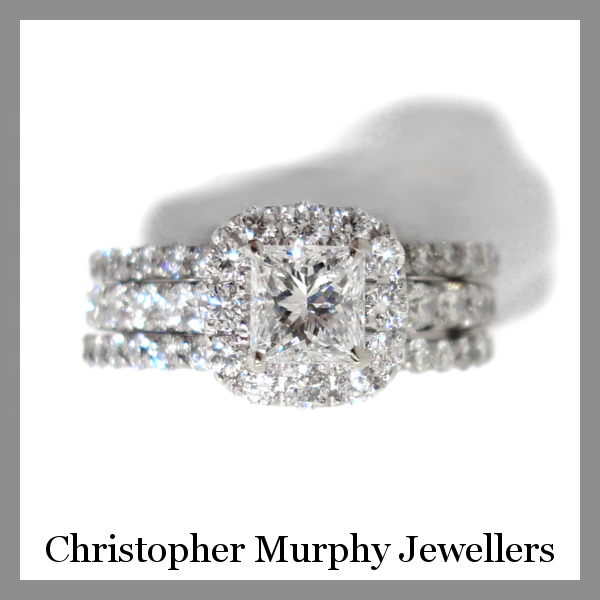 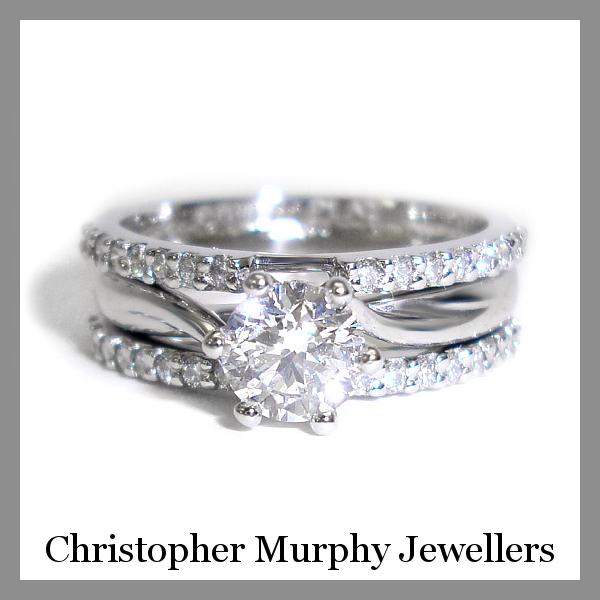 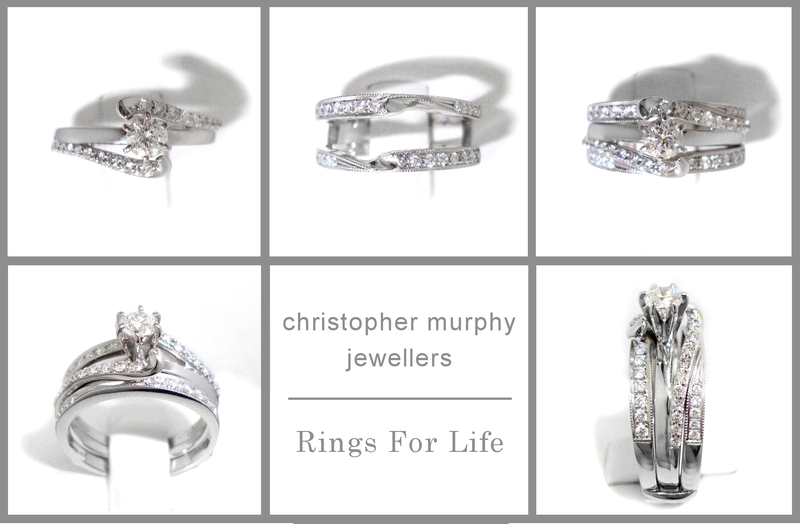 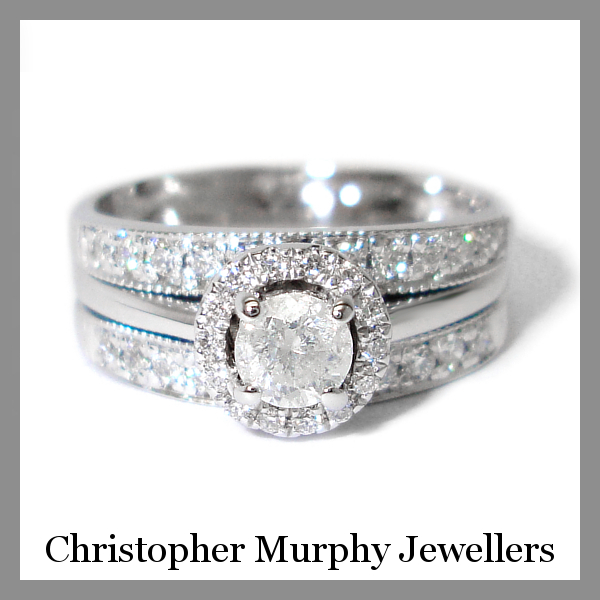 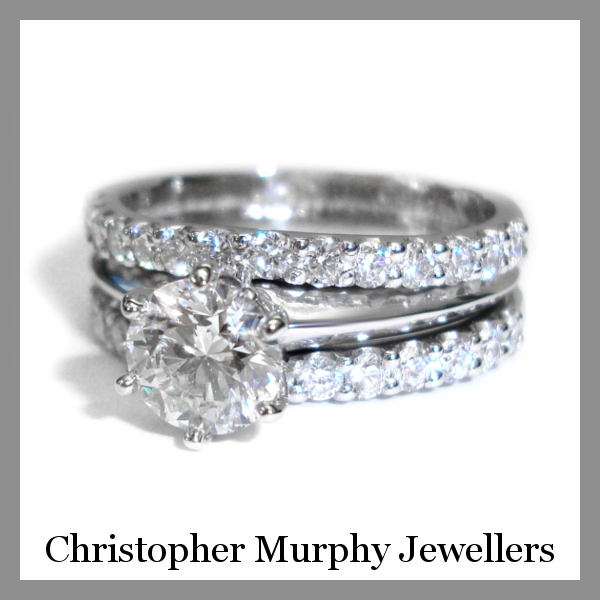 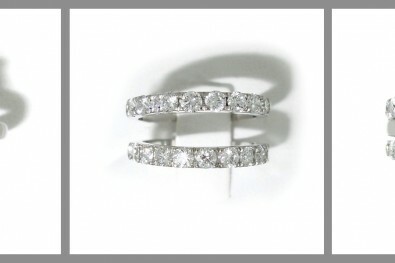 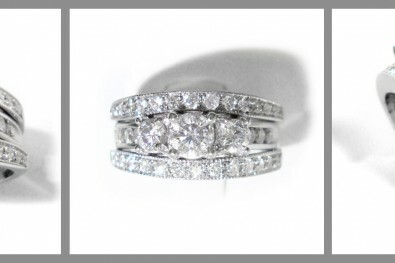 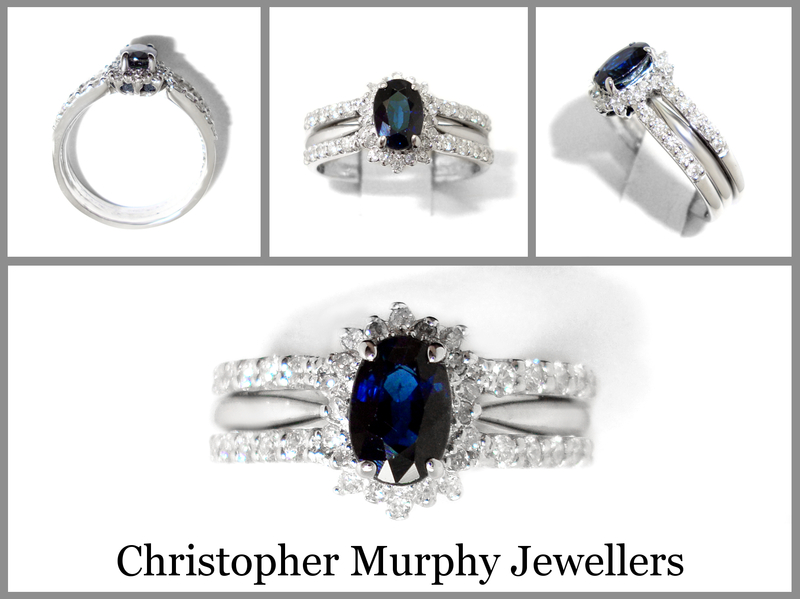 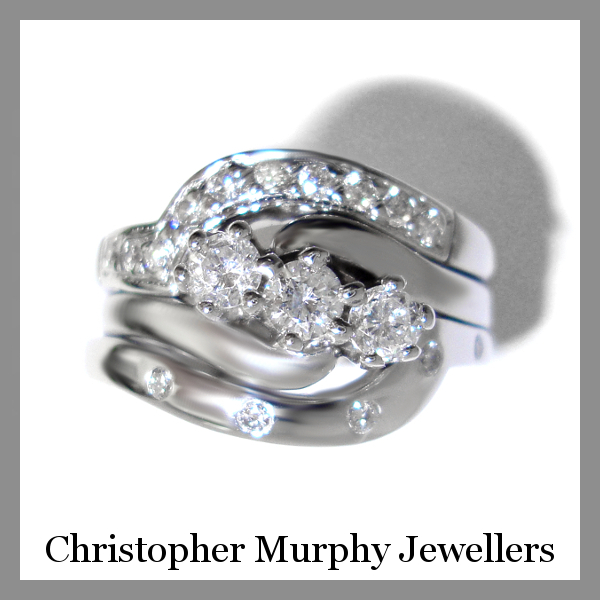 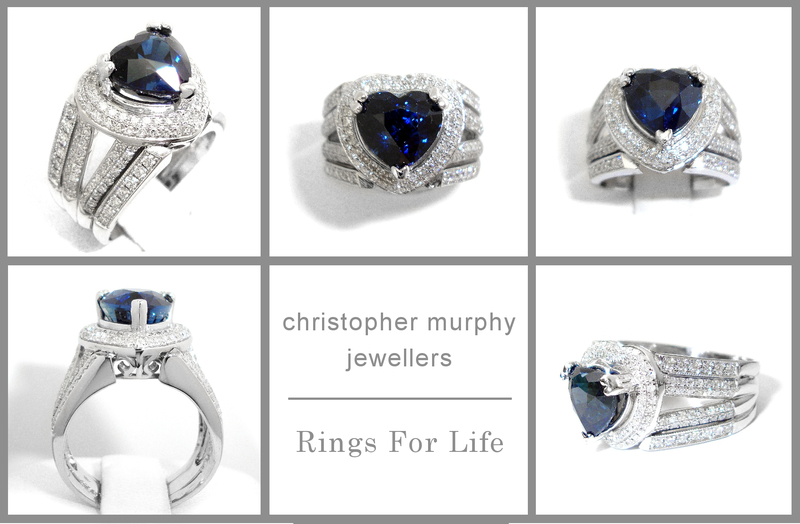 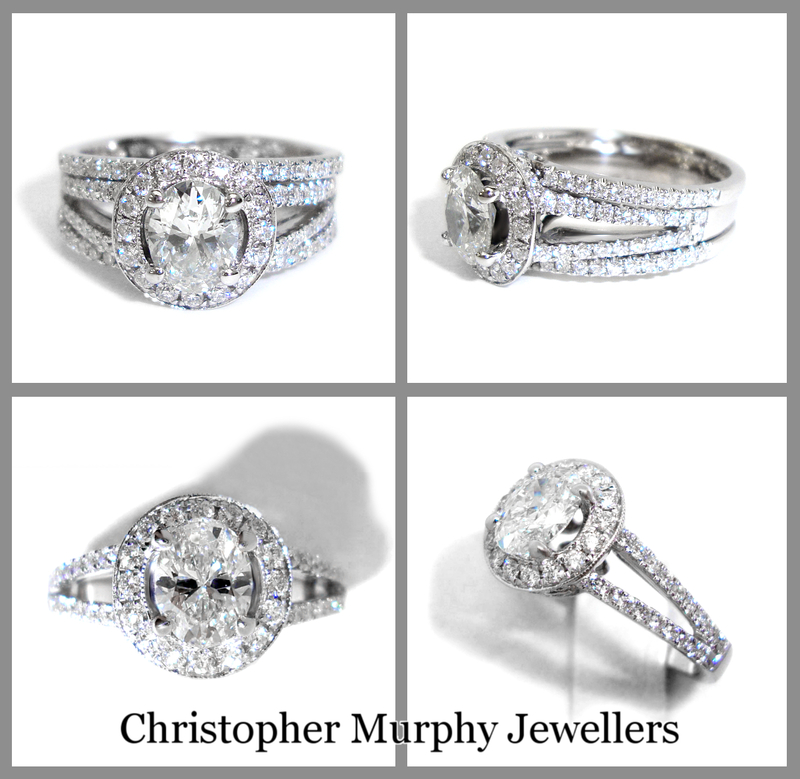 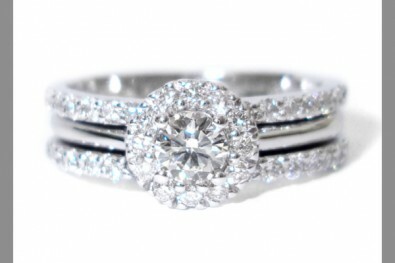 All our Double Wedding Rings are handmade instore to the highest quality and standards. 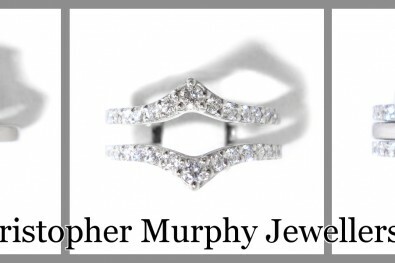 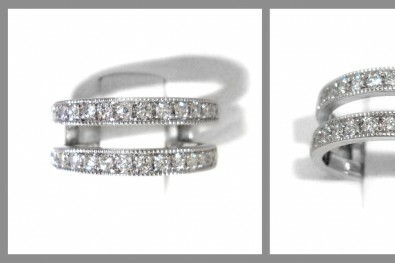 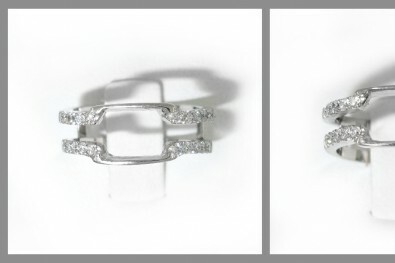 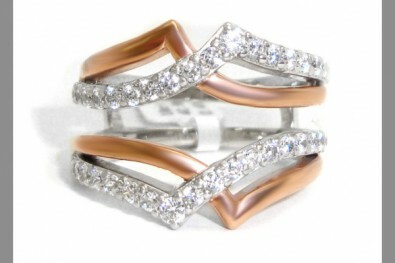 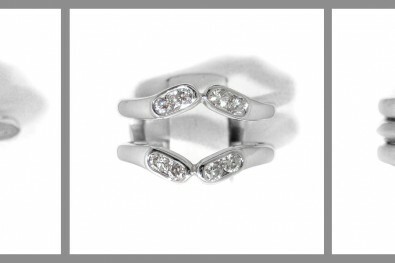 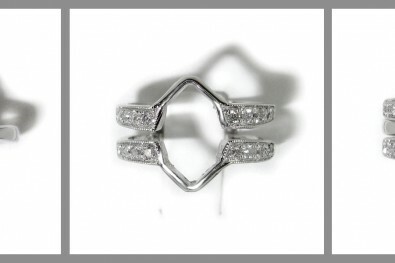 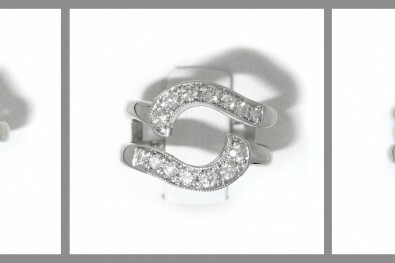 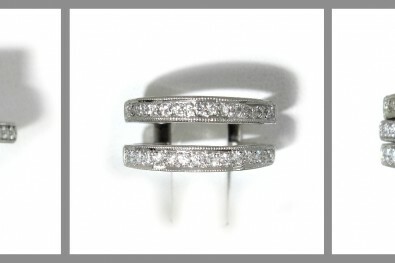 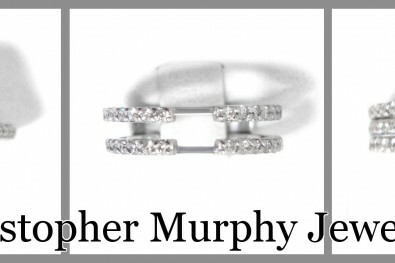 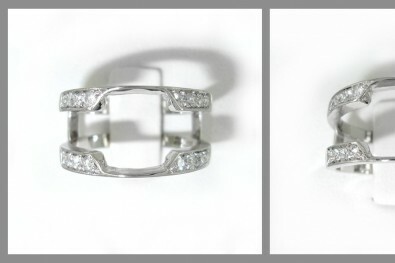 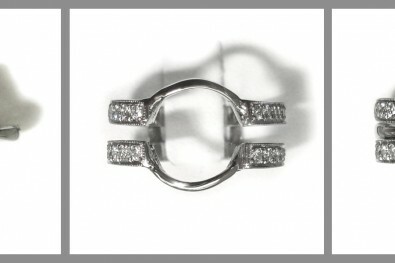 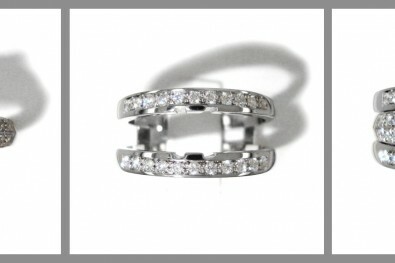 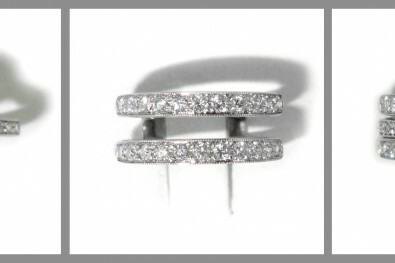 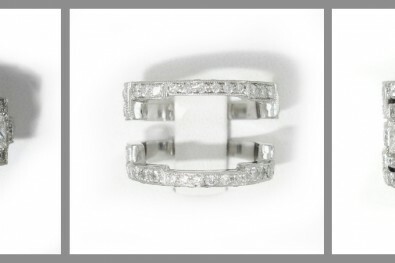 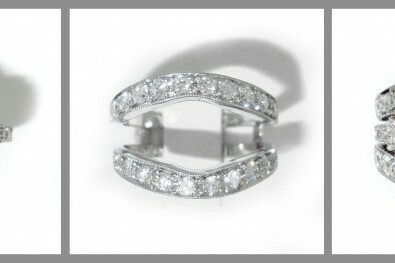 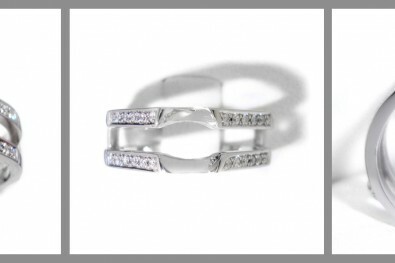 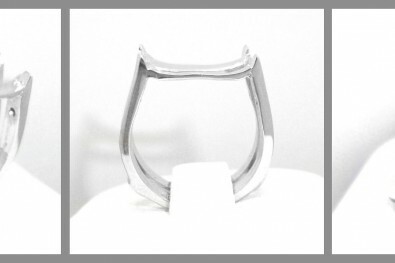 The three rings can also be fused together and can easily be taken apart if you ever wish. 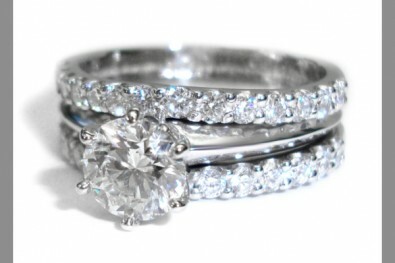 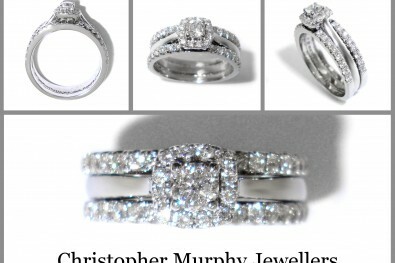 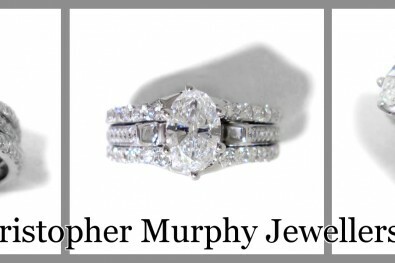 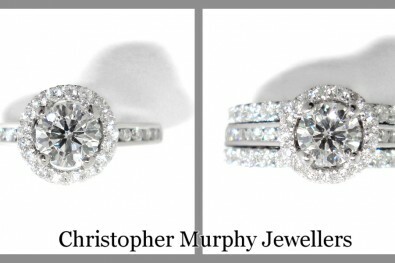 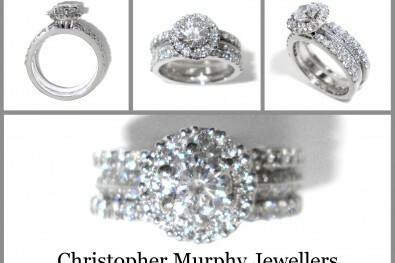 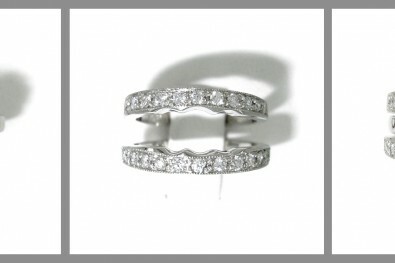 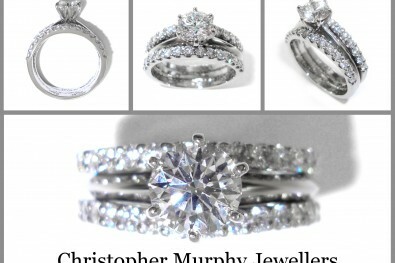 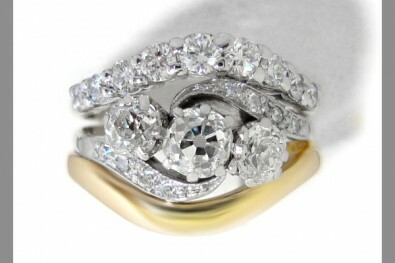 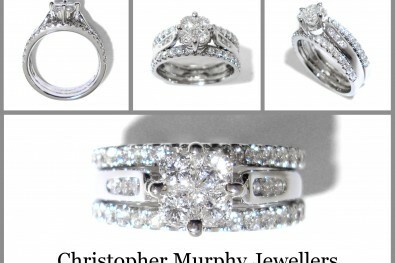 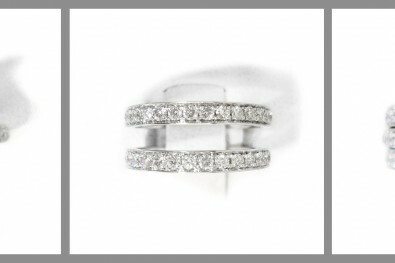 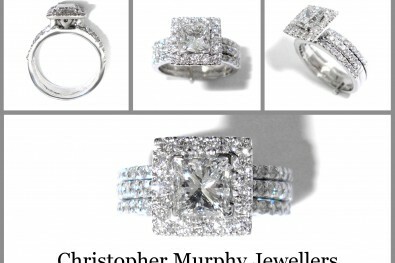 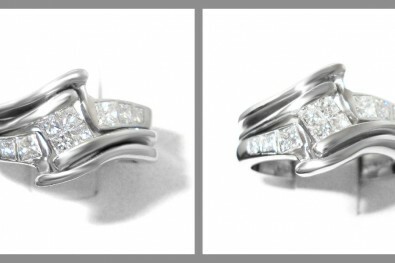 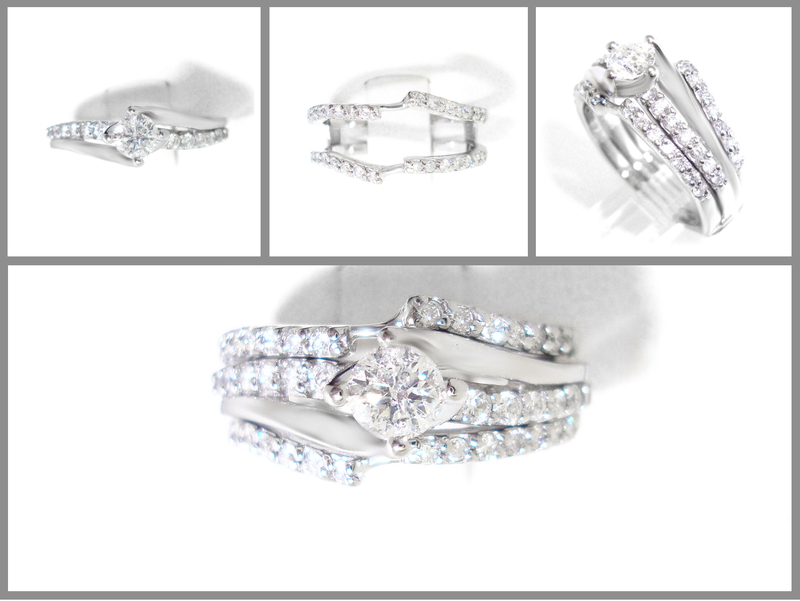 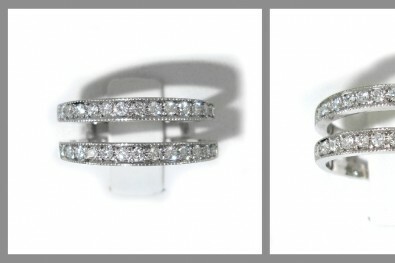 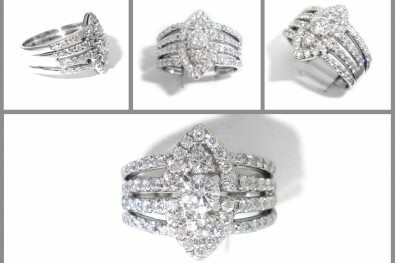 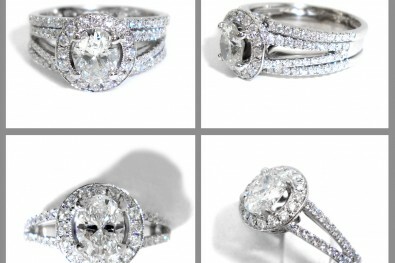 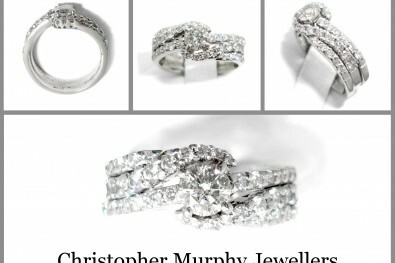 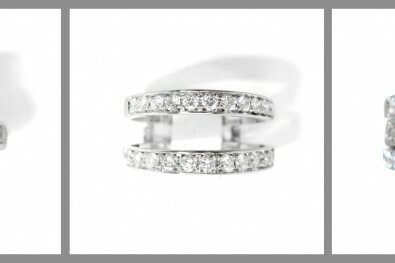 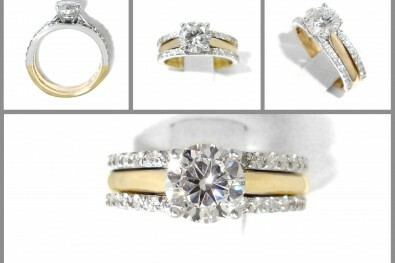 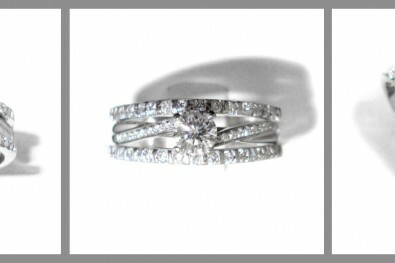 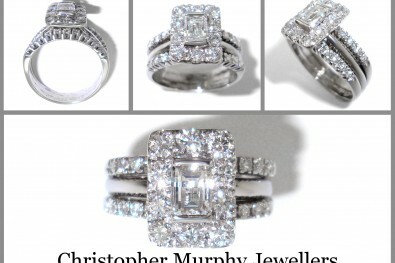 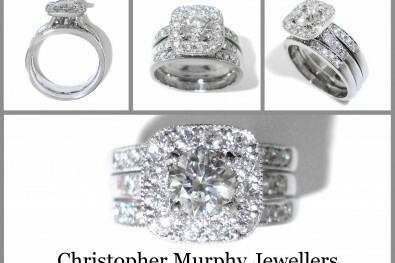 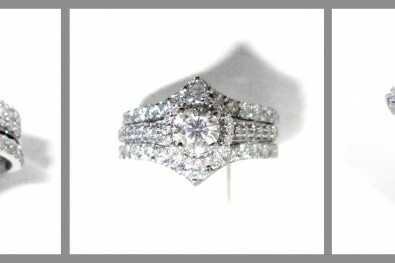 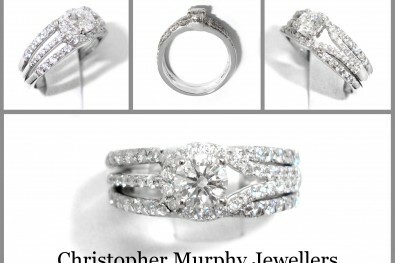 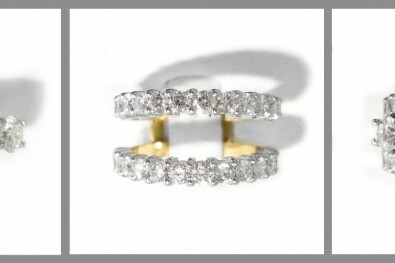 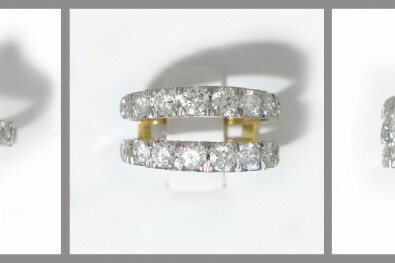 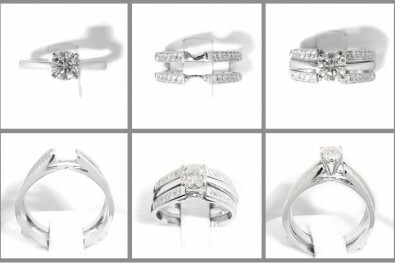 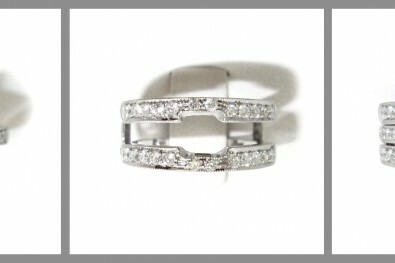 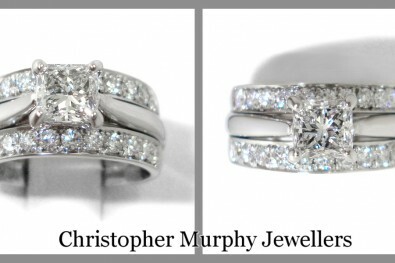 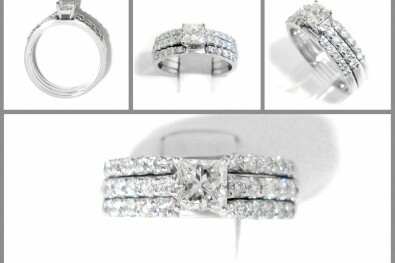 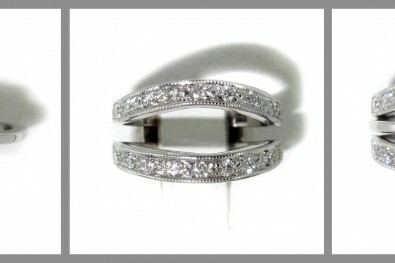 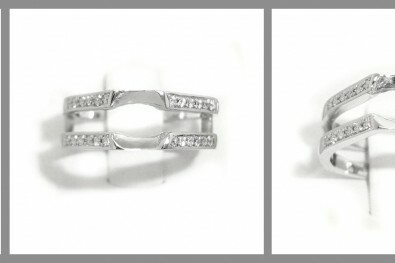 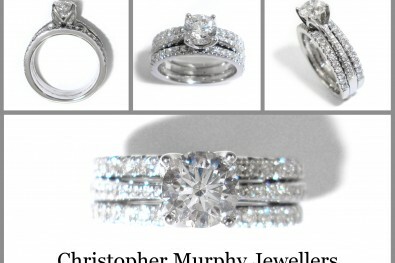 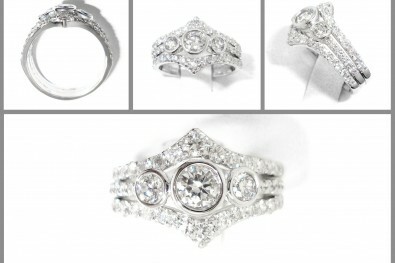 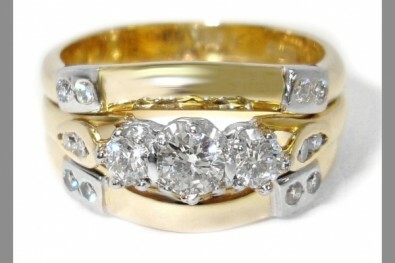 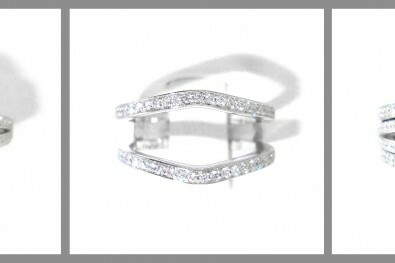 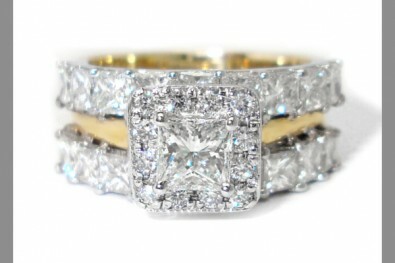 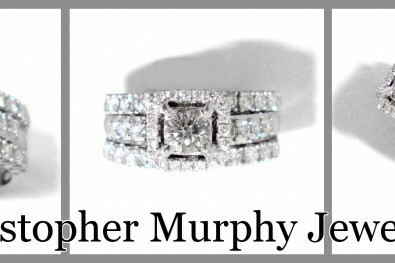 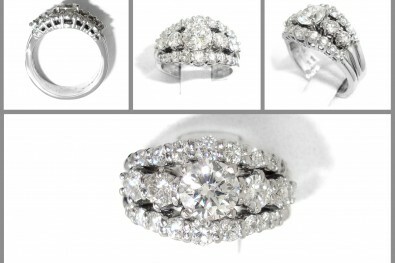 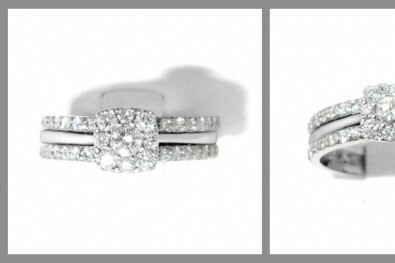 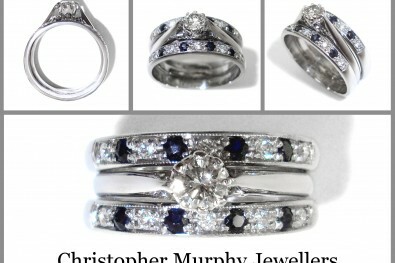 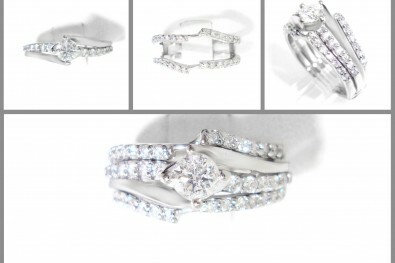 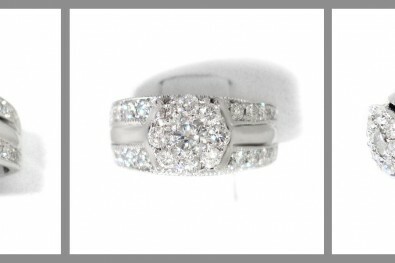 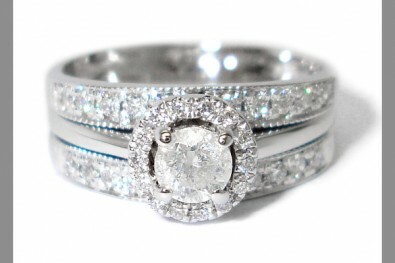 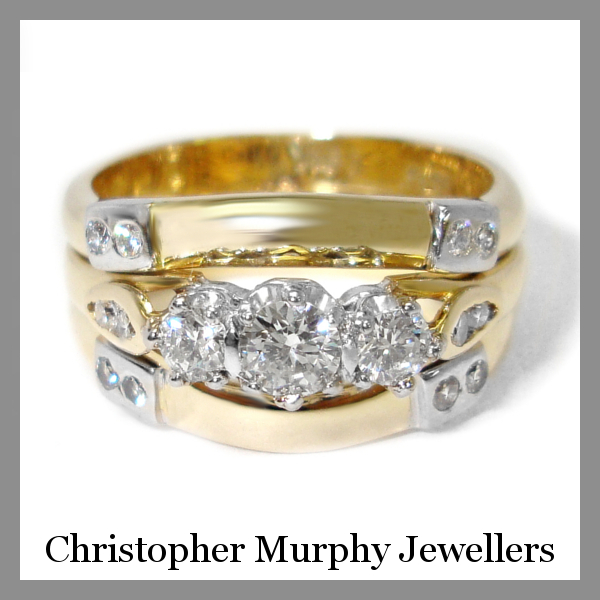 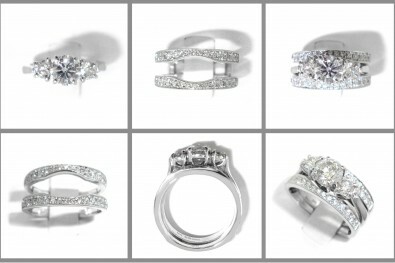 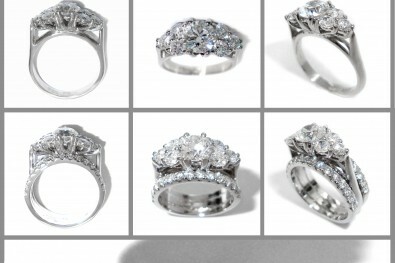 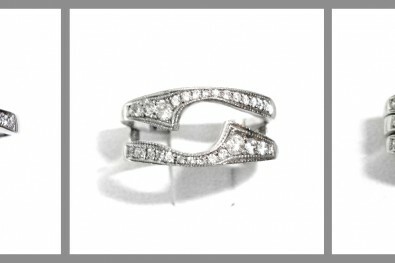 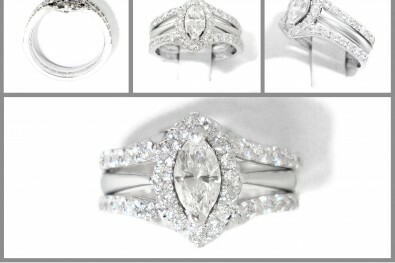 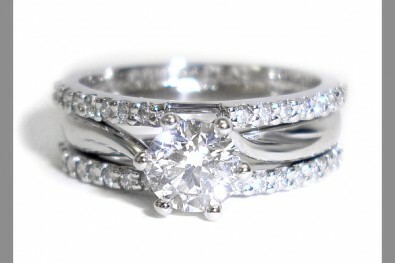 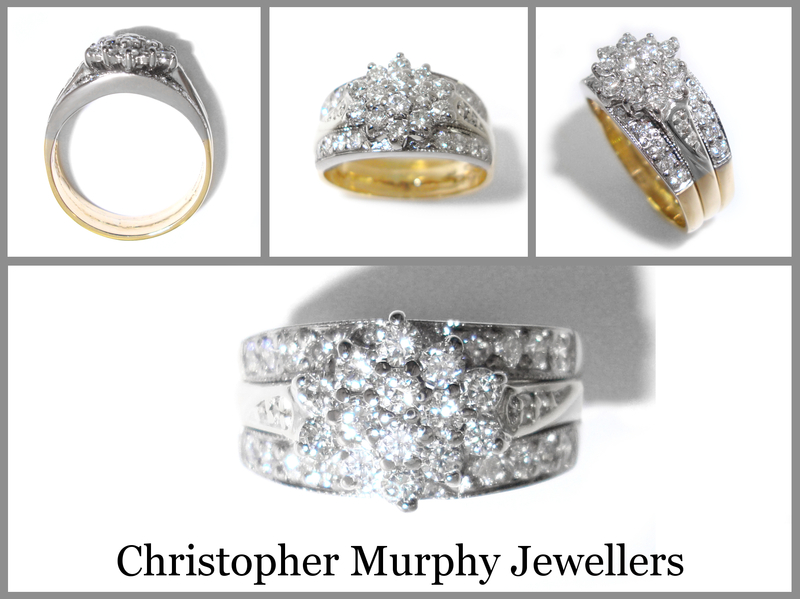 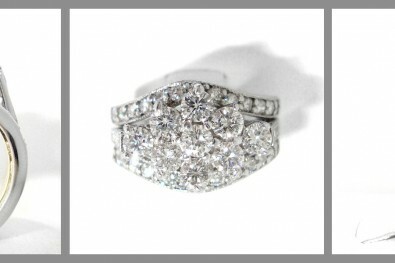 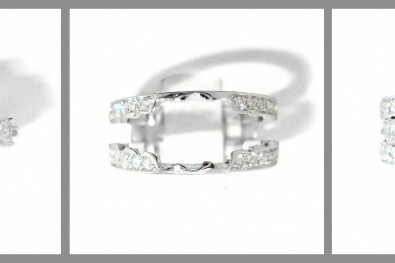 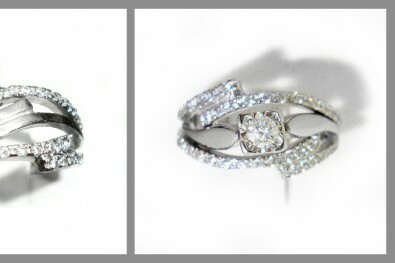 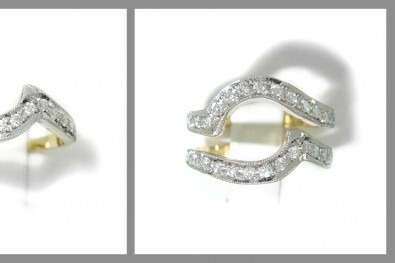 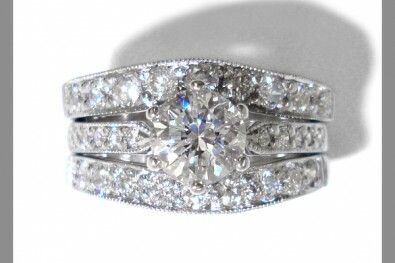 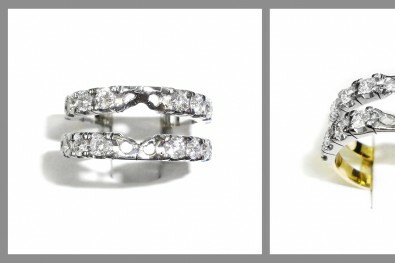 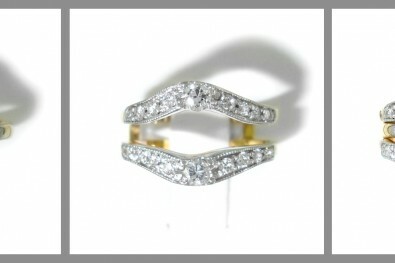 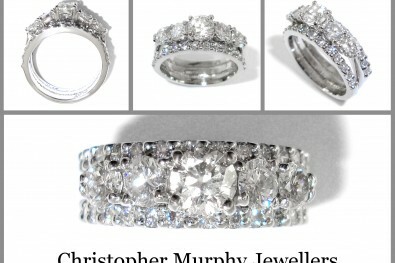 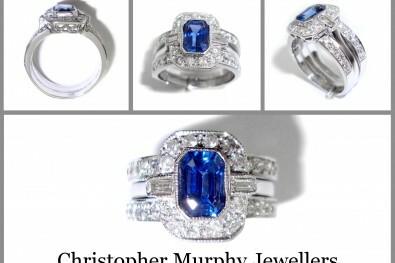 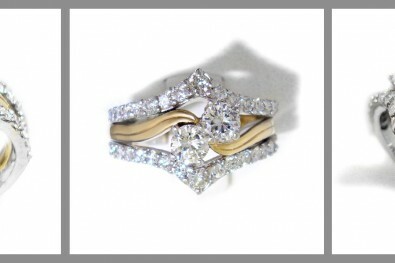 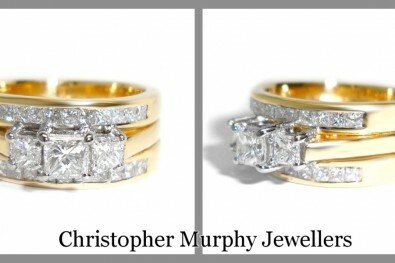 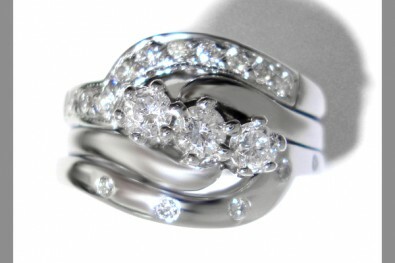 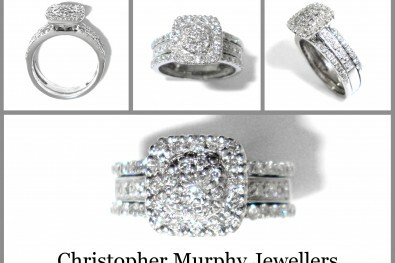 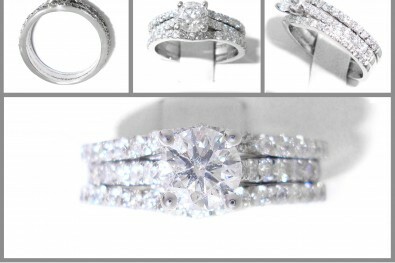 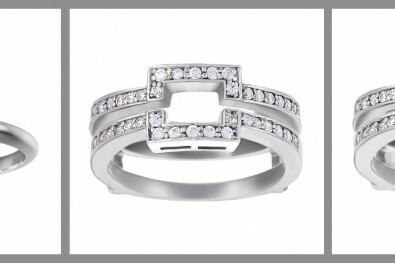 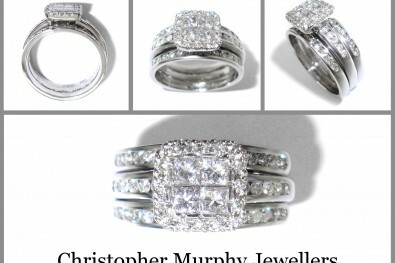 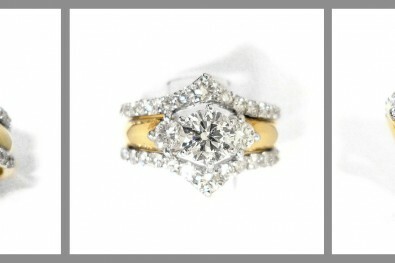 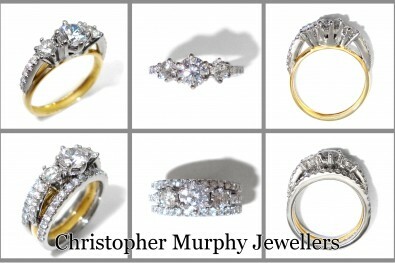 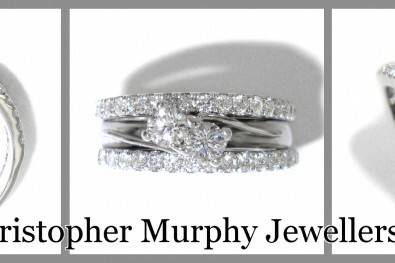 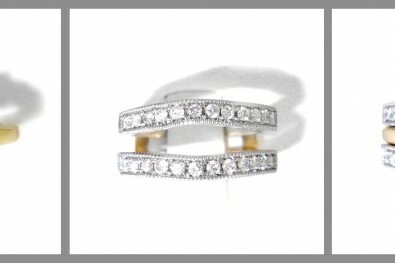 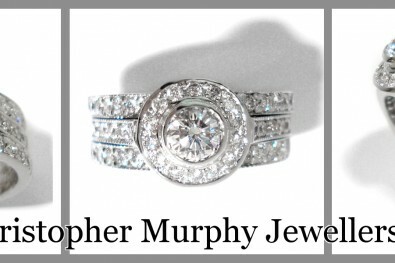 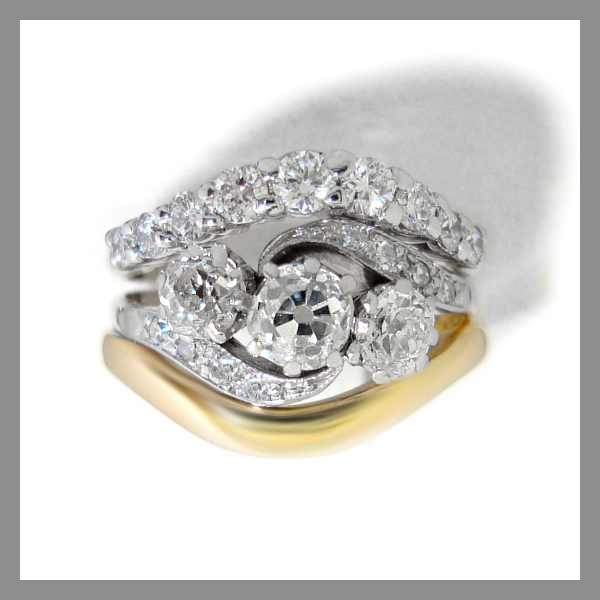 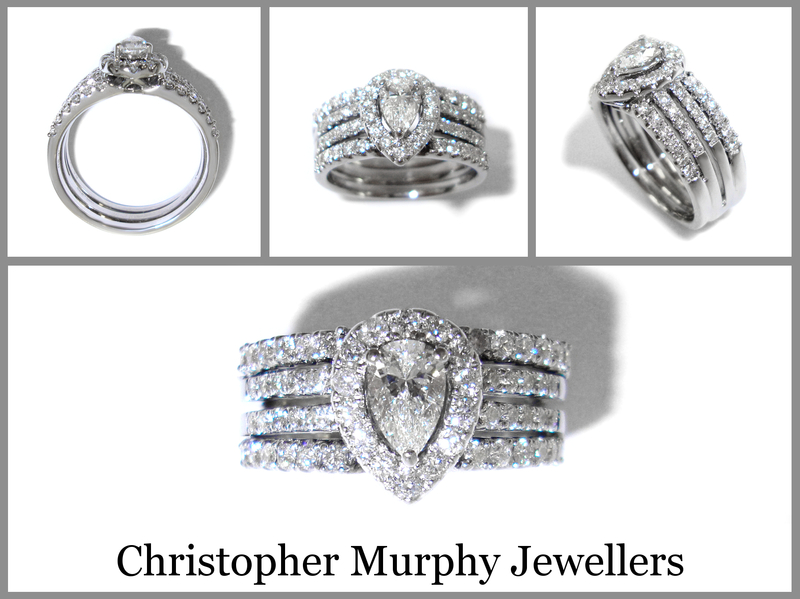 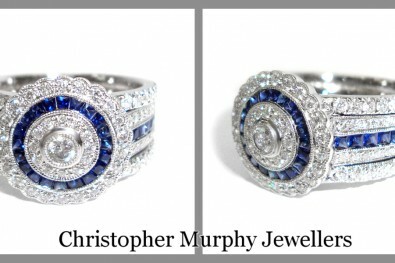 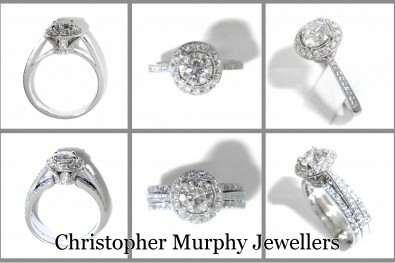 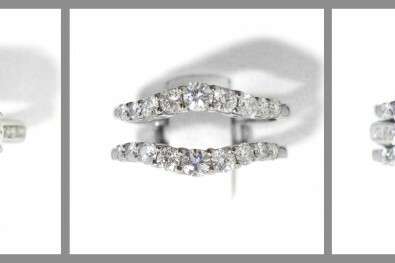 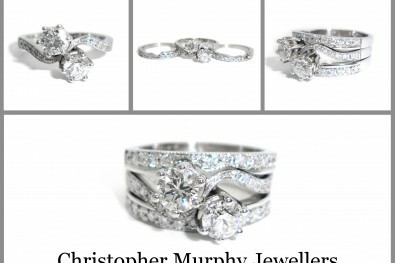 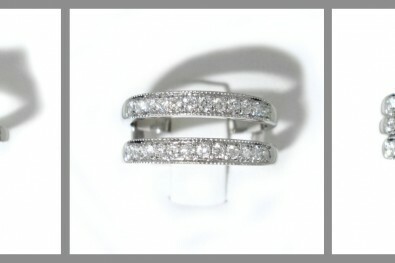 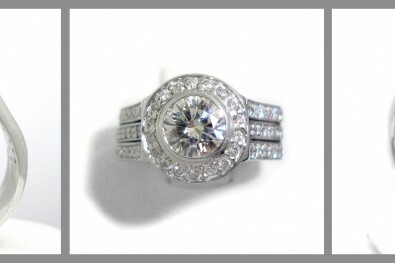 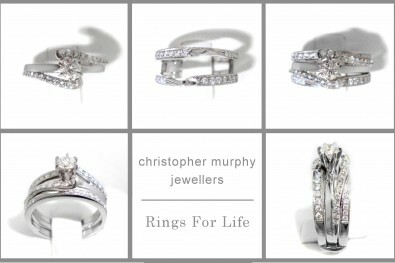 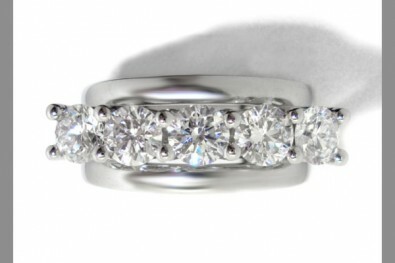 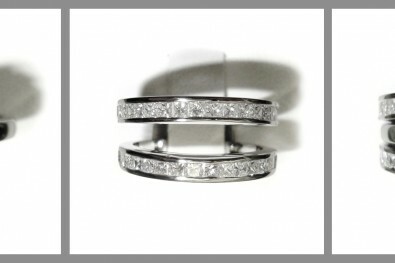 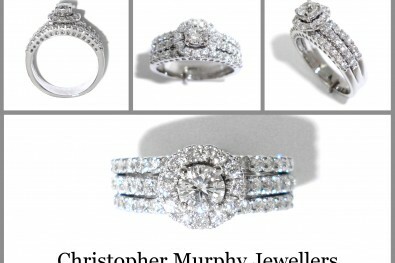 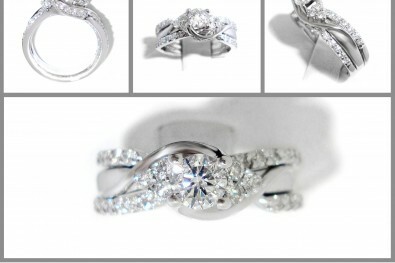 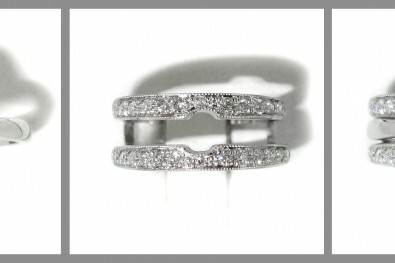 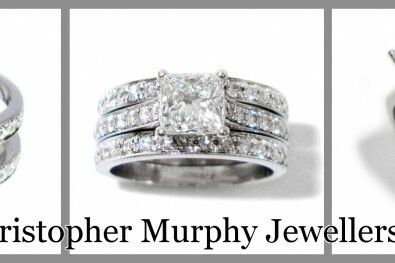 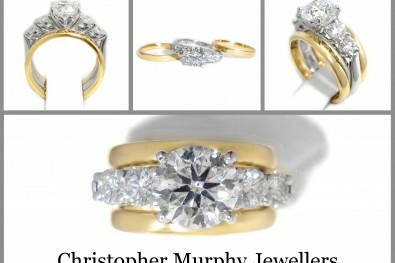 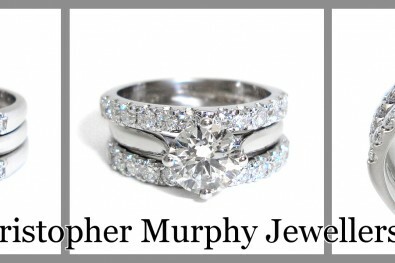 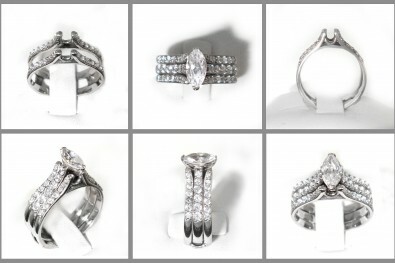 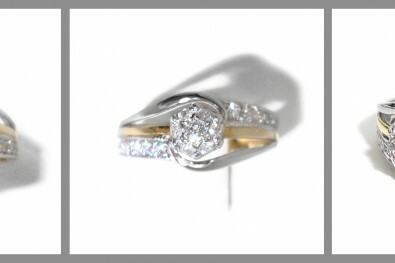 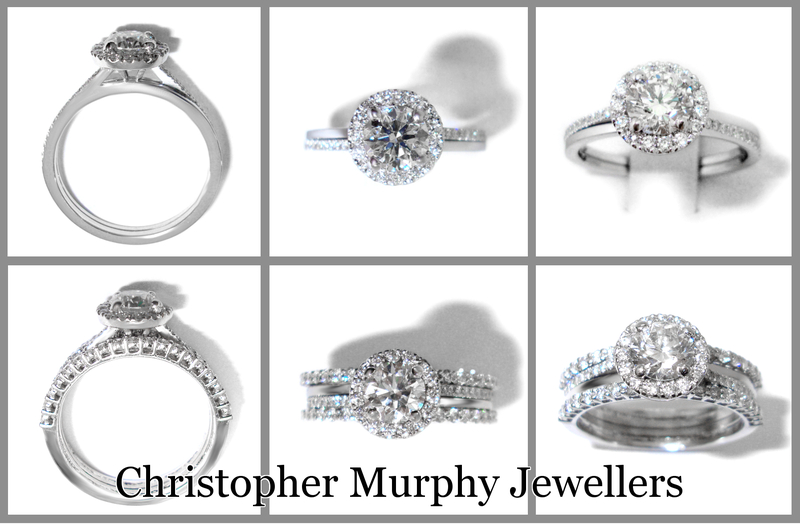 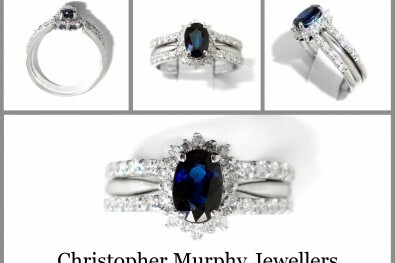 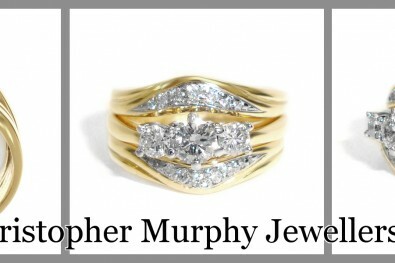 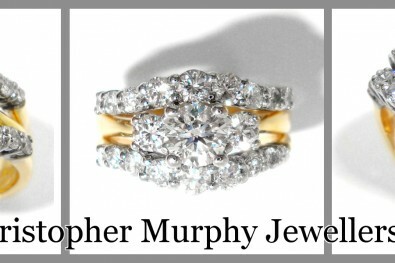 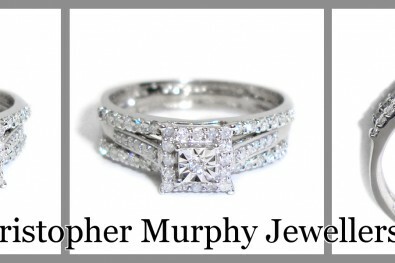 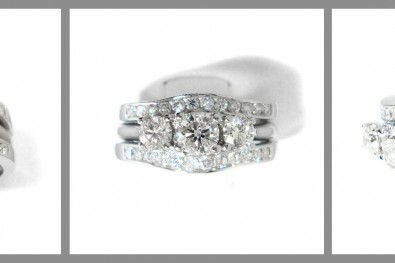 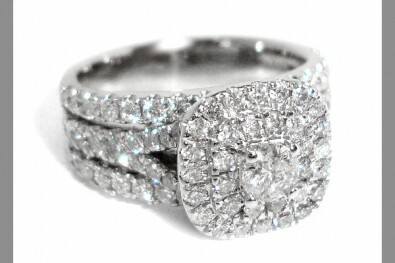 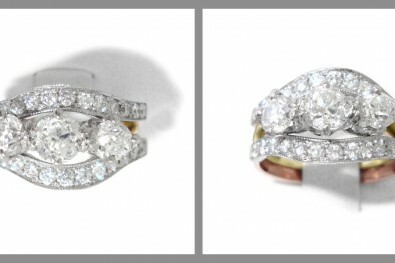 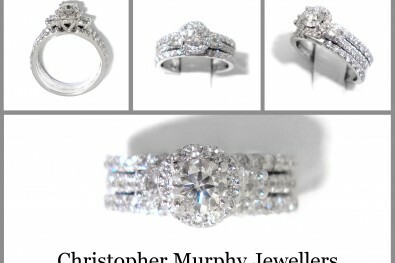 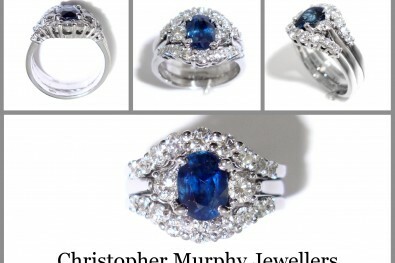 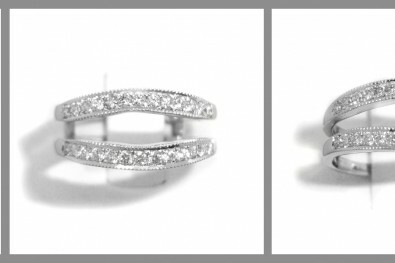 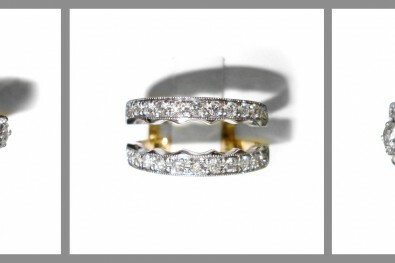 Have a look in our Wedding Ring section..
All individual wedding rings can be made as Double Wedding Rings. 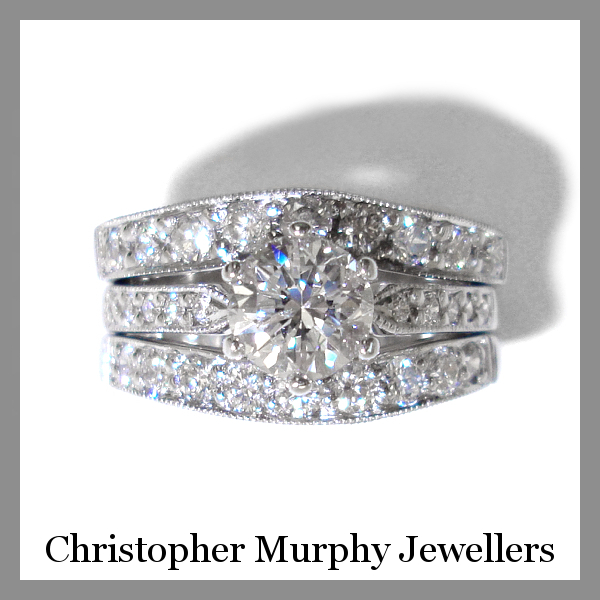 We are committed to offering you exceptional quality, unrivaled choice and real value. 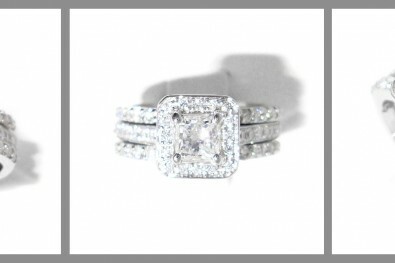 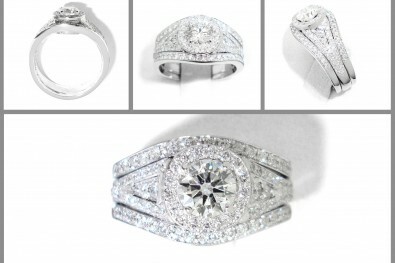 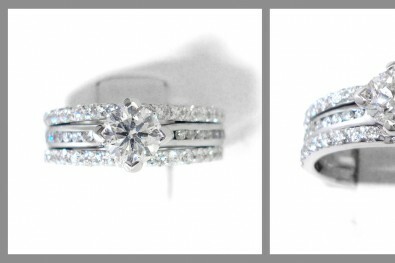 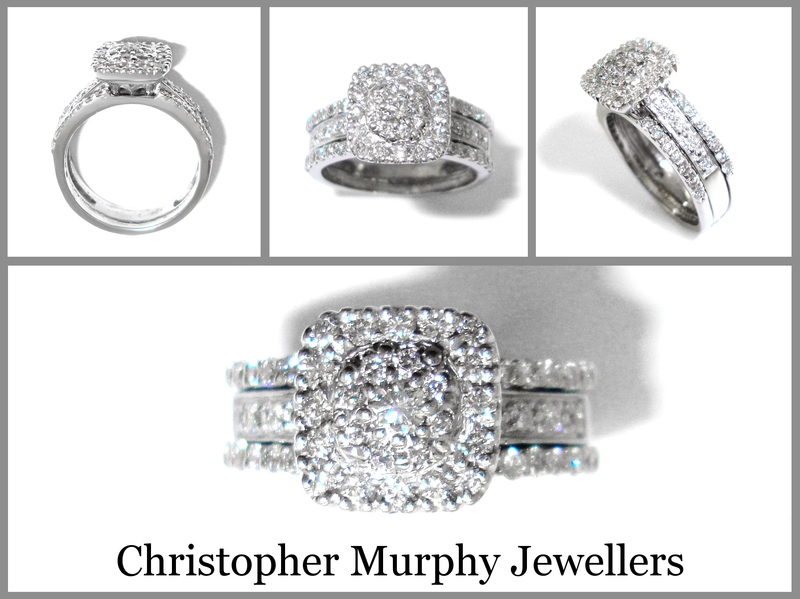 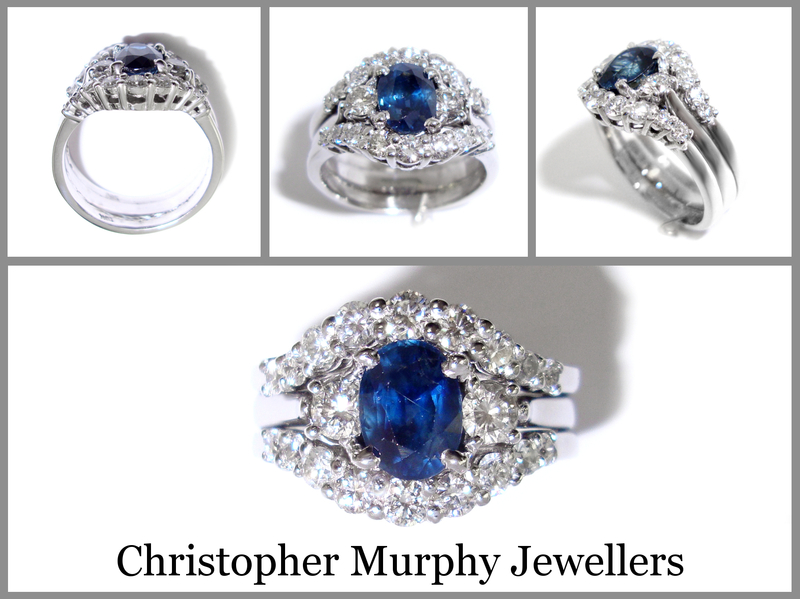 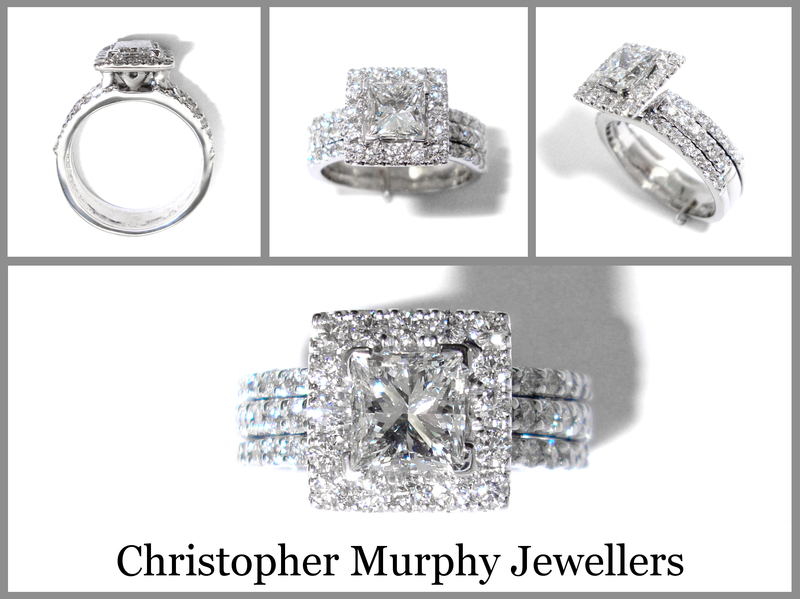 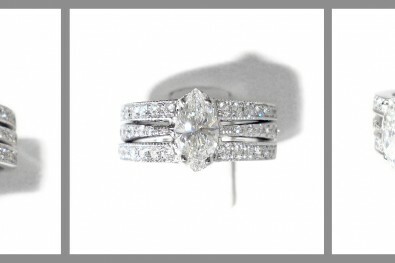 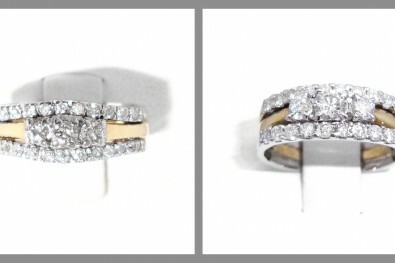 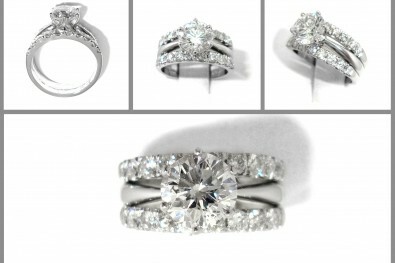 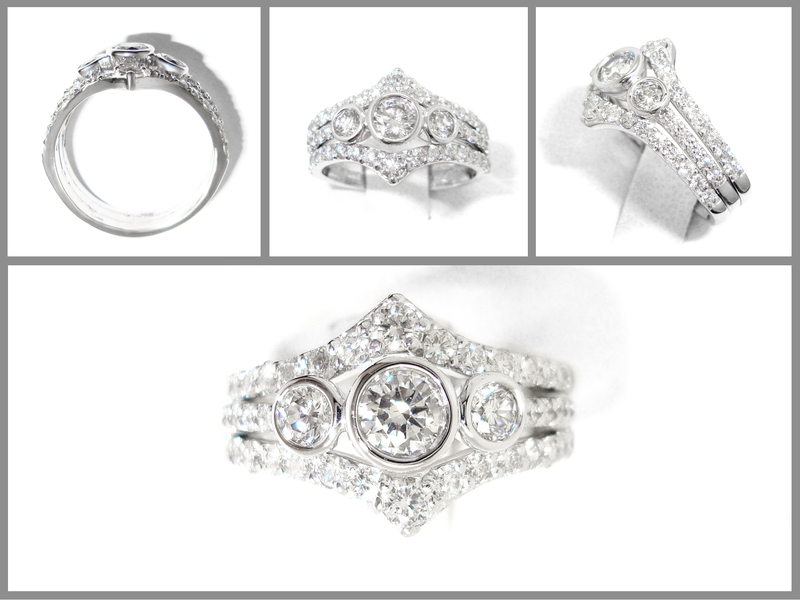 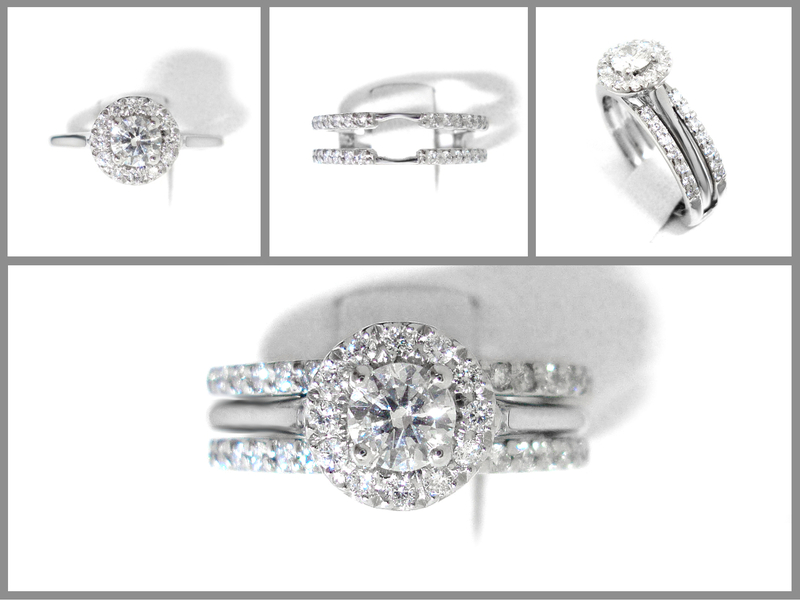 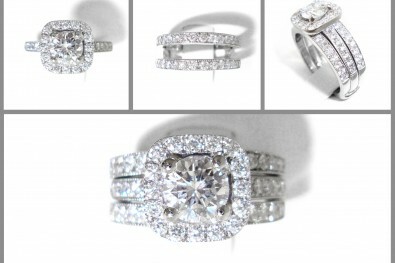 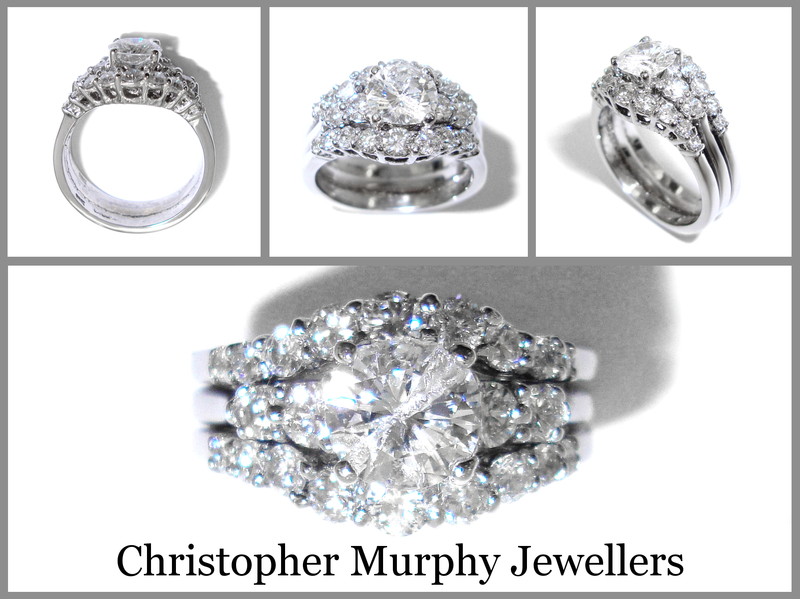 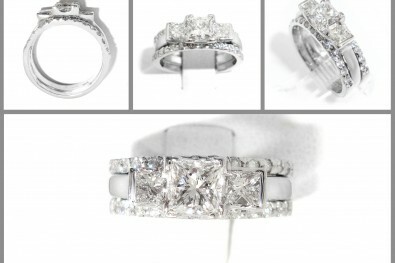 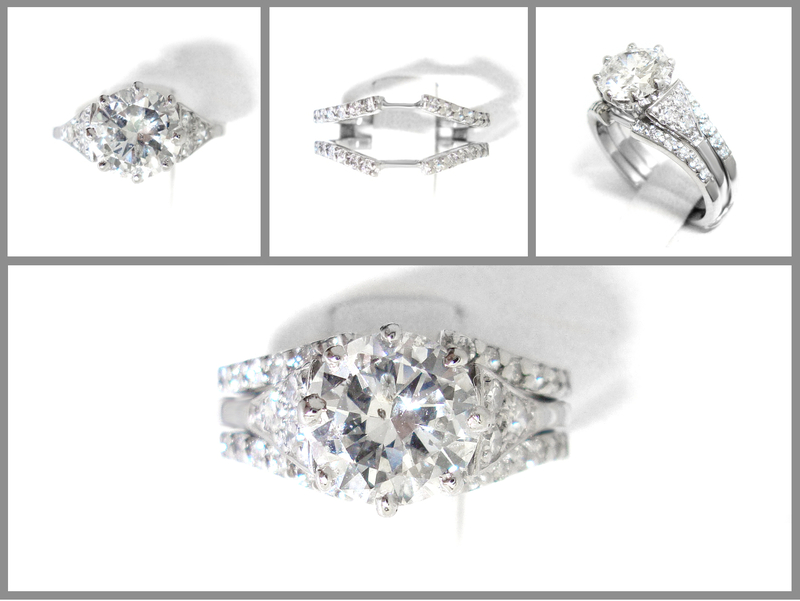 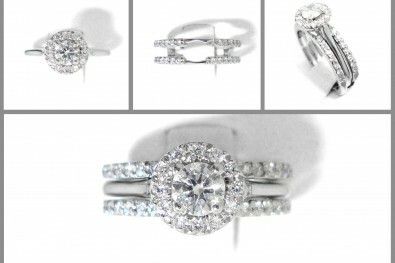 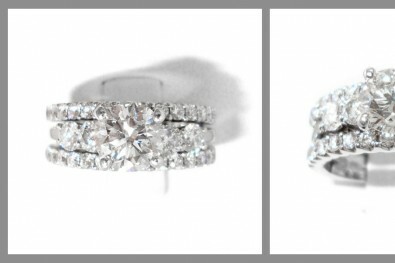 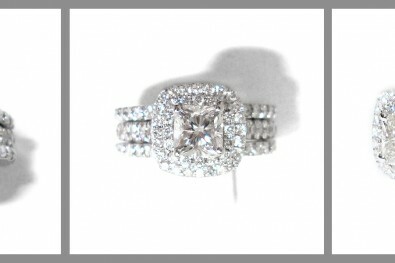 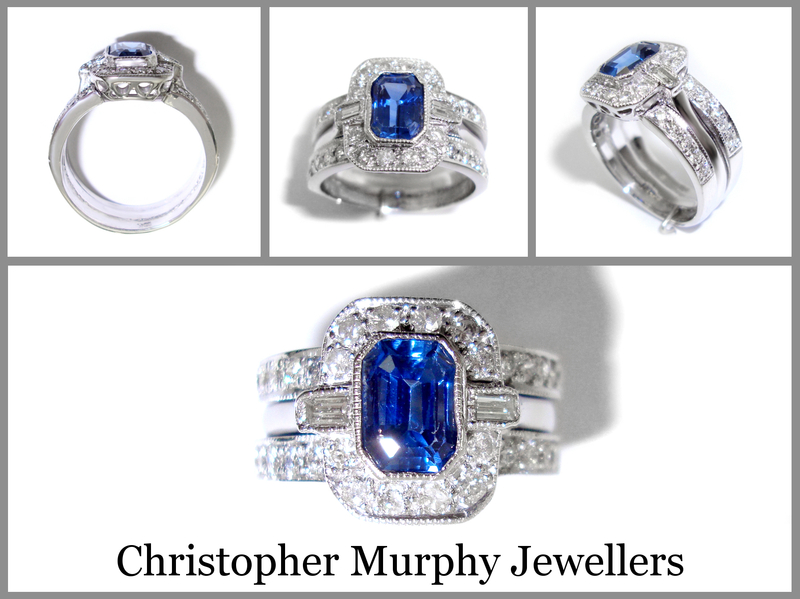 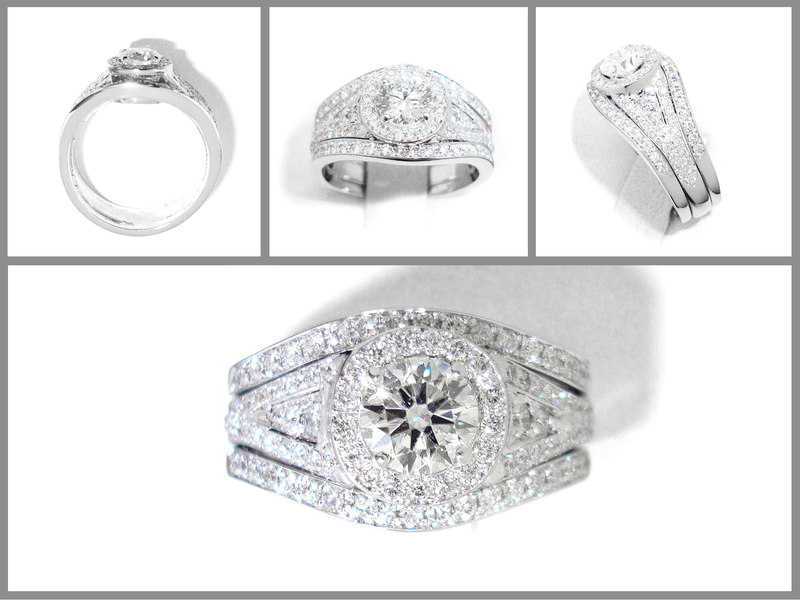 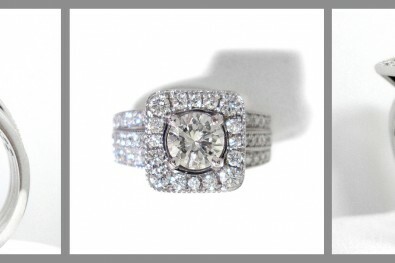 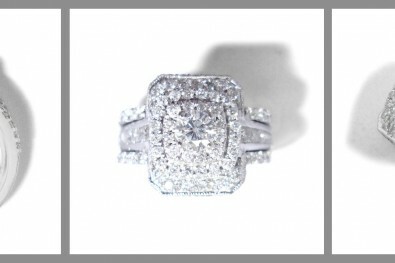 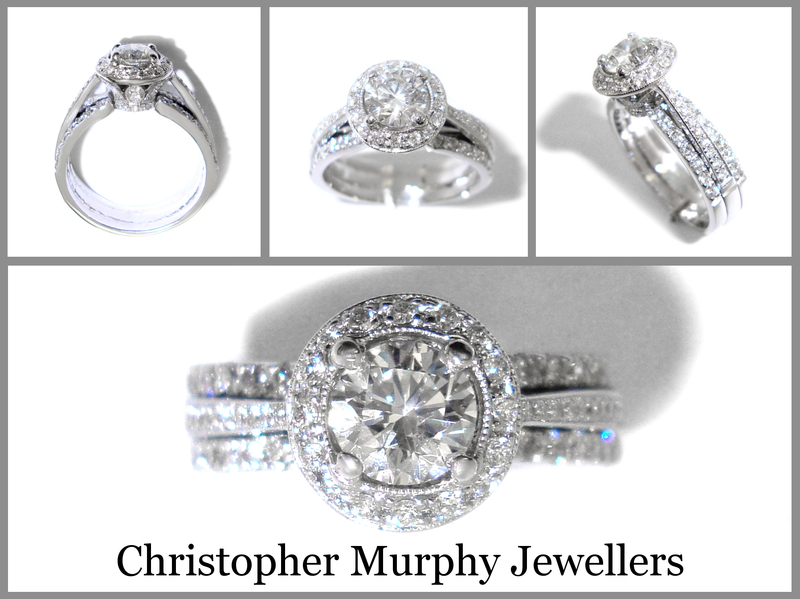 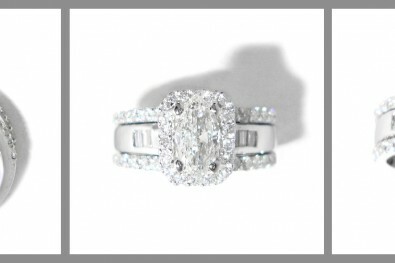 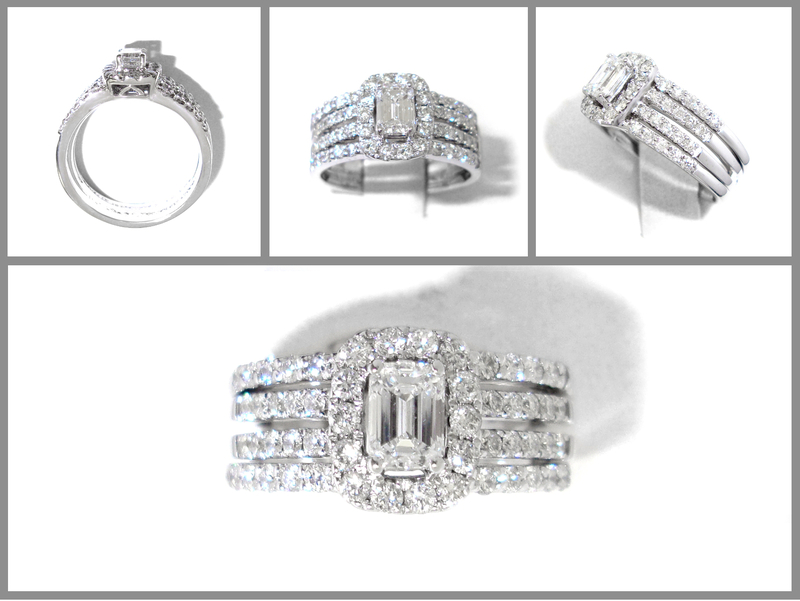 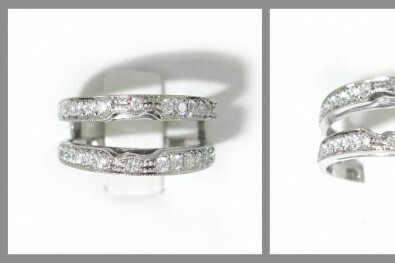 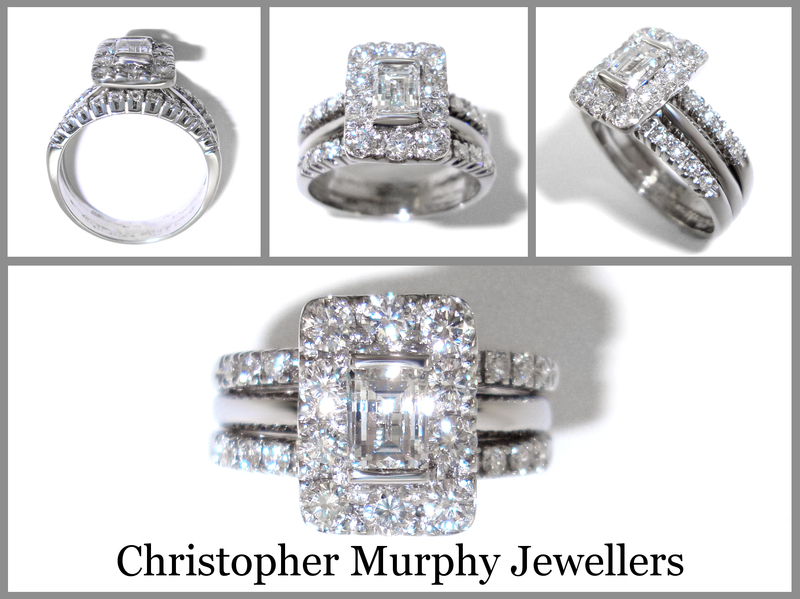 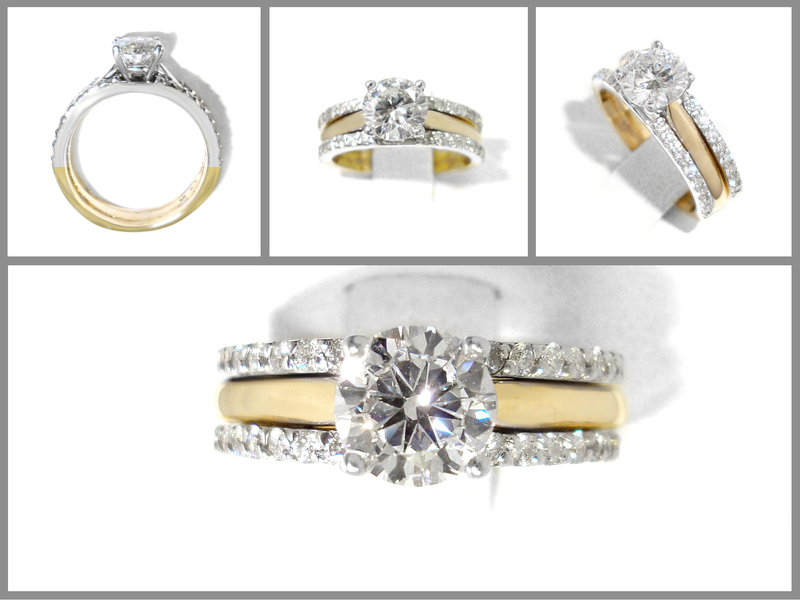 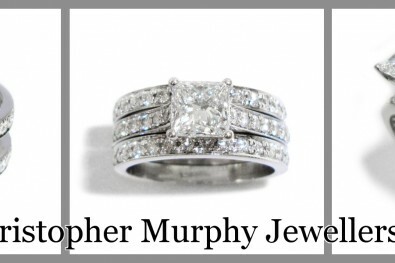 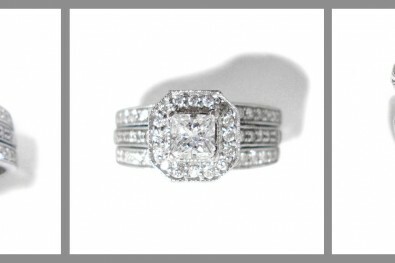 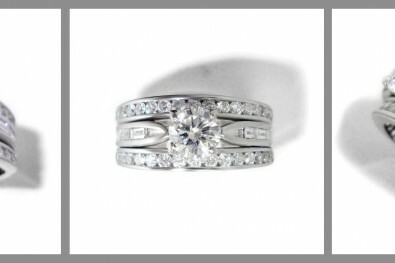 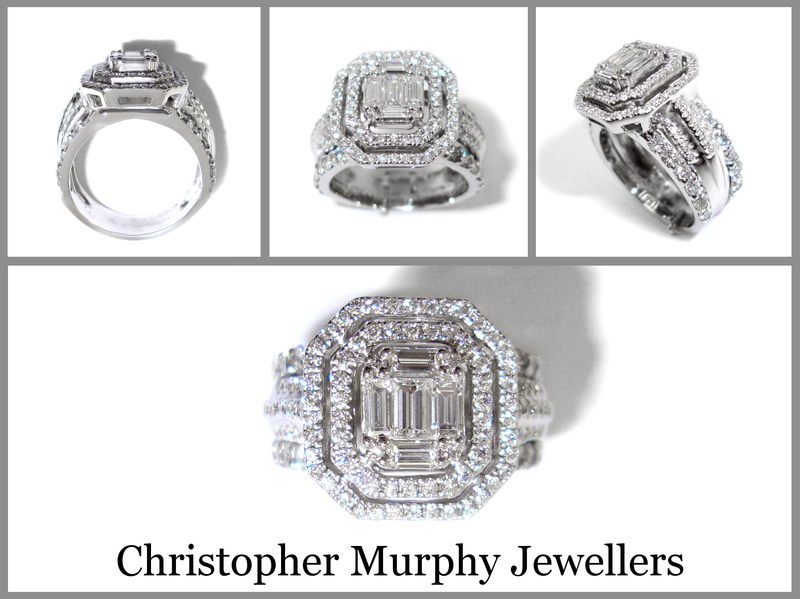 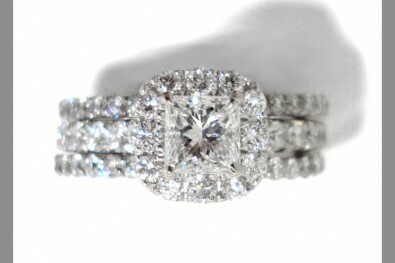 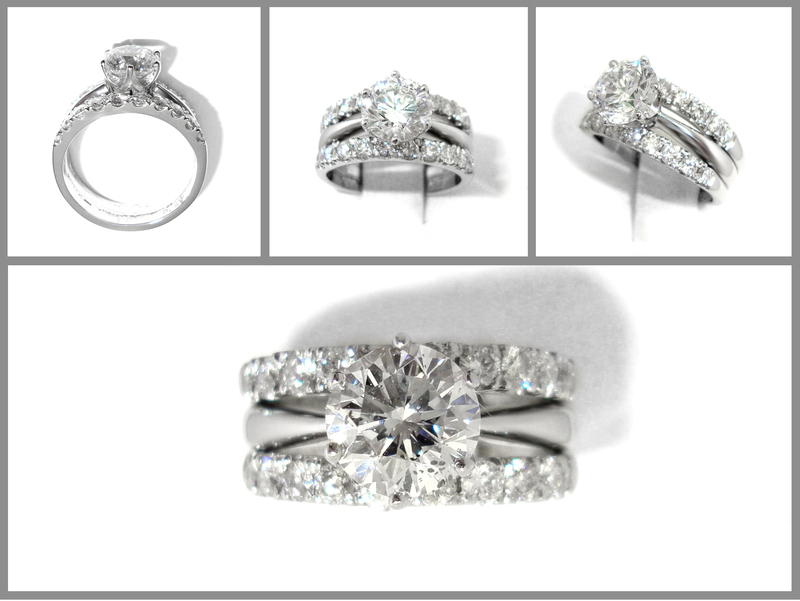 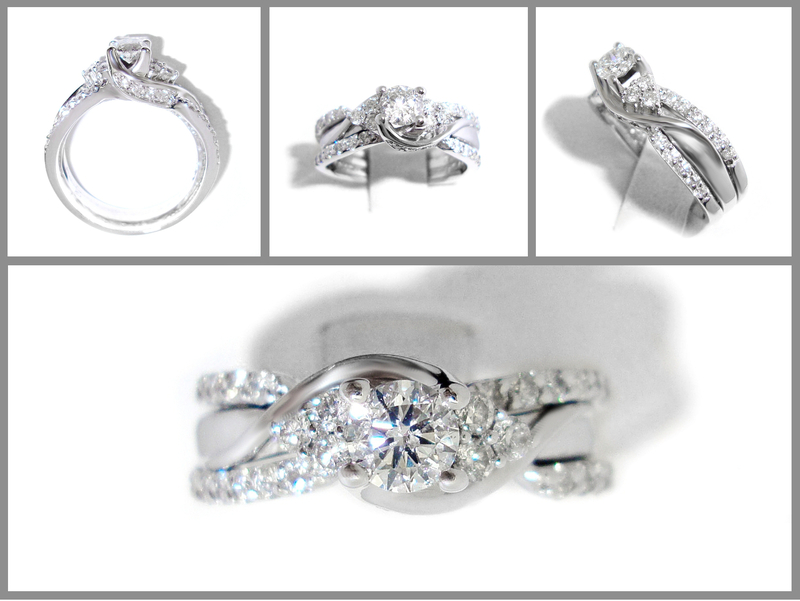 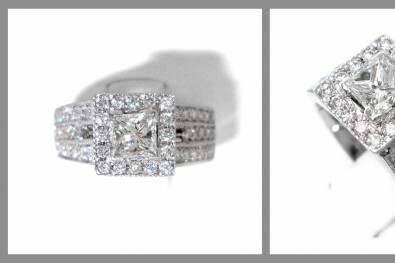 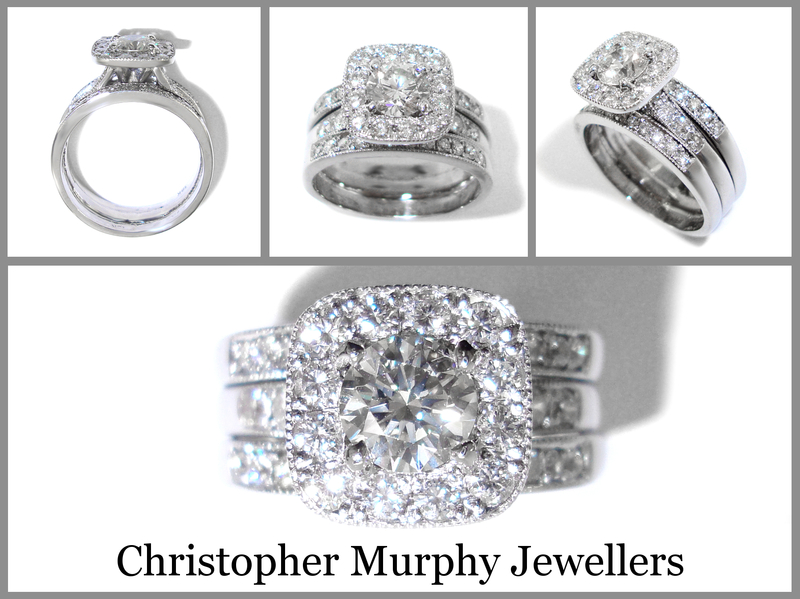 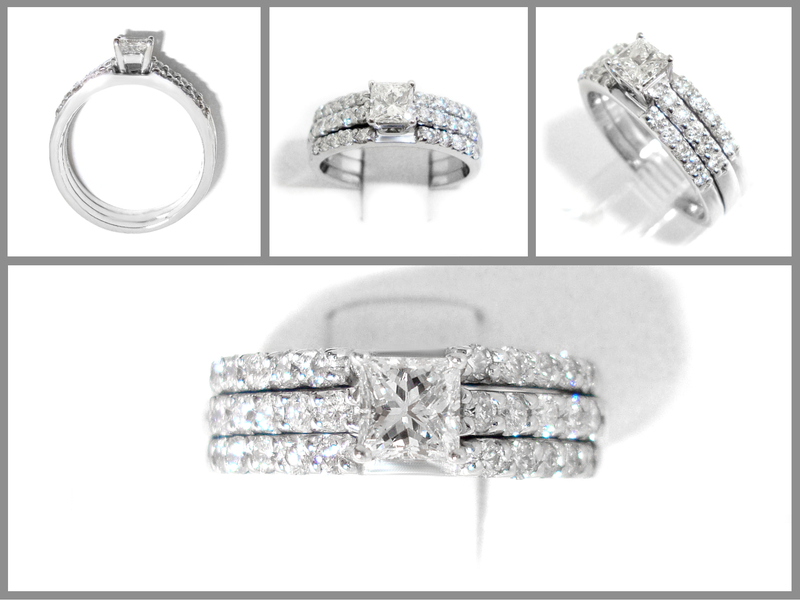 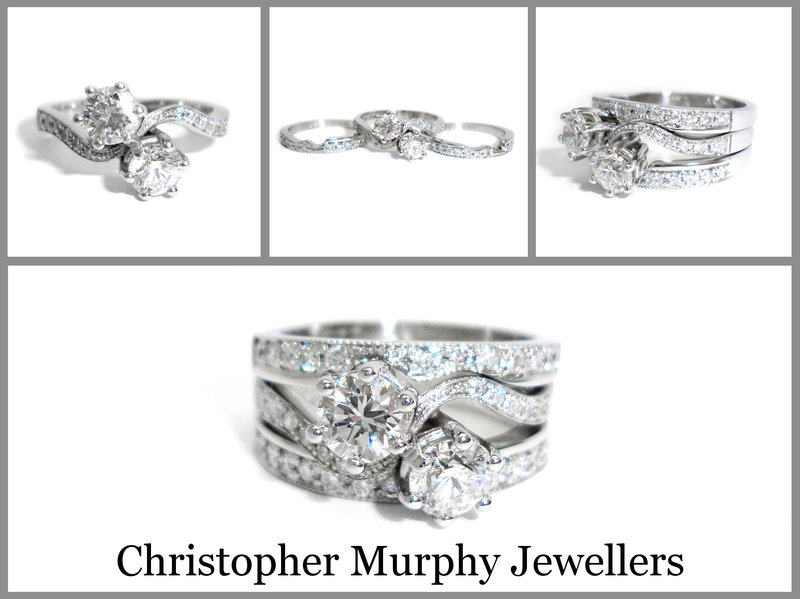 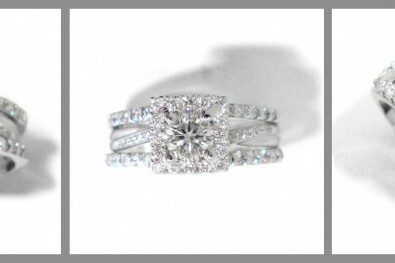 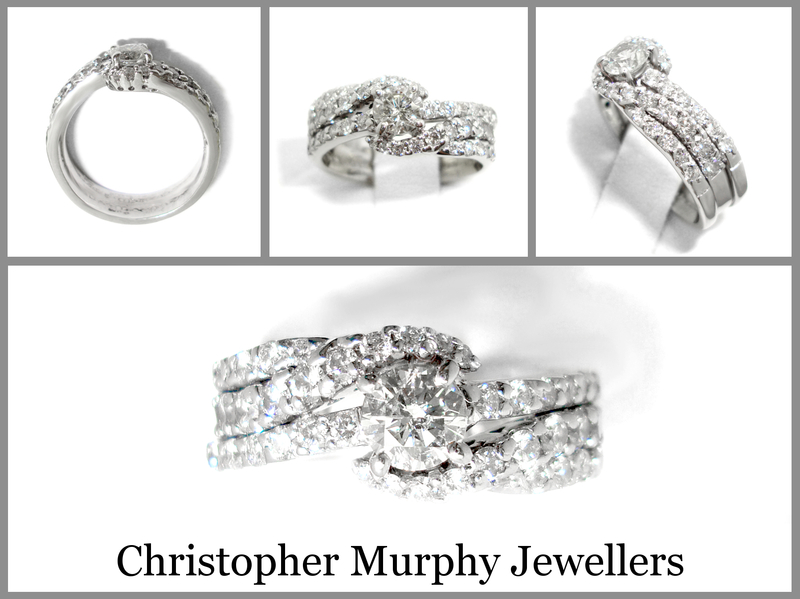 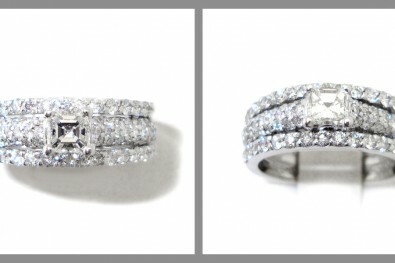 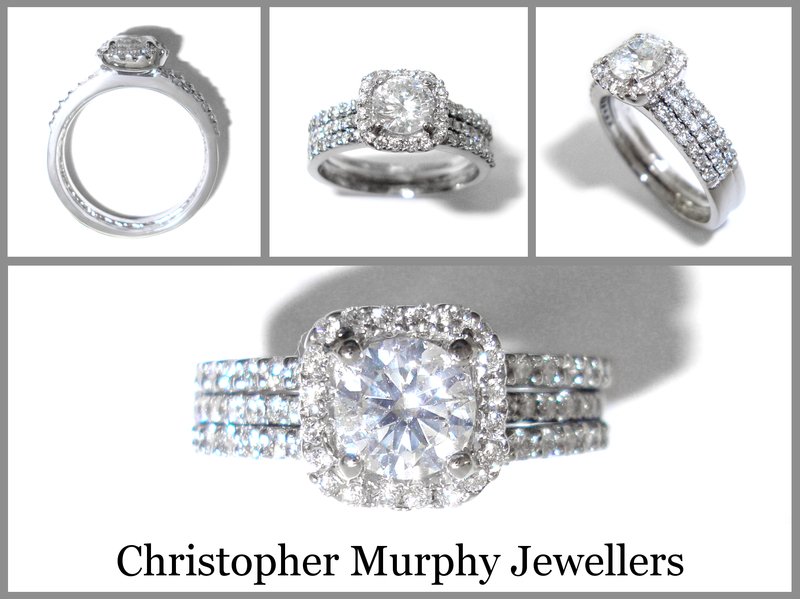 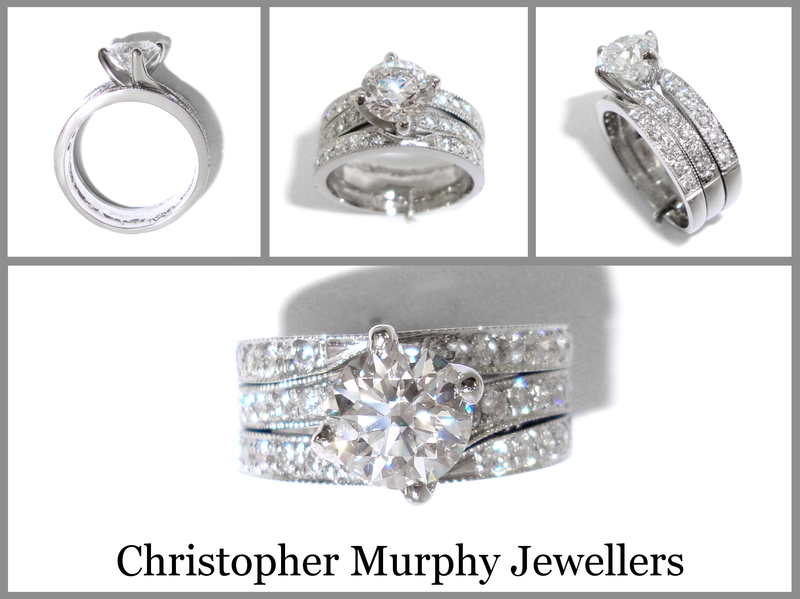 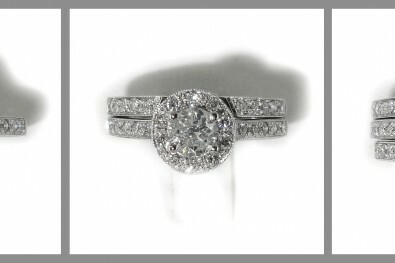 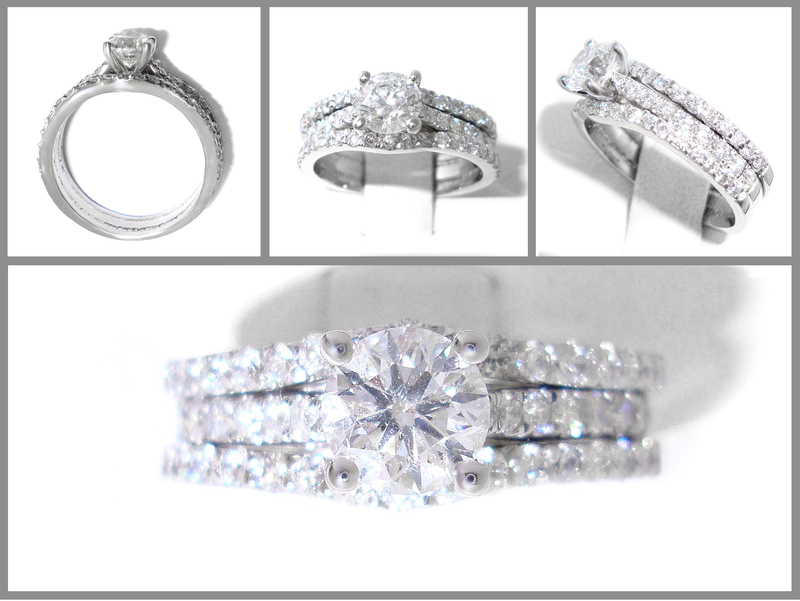 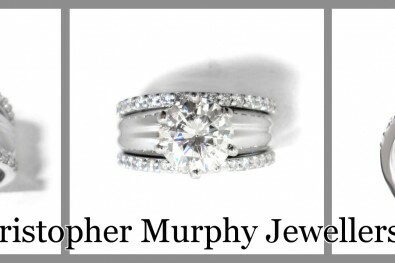 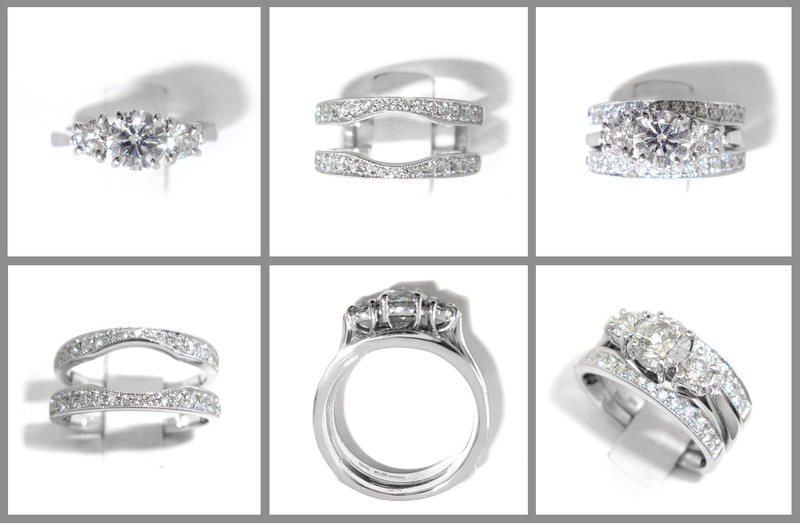 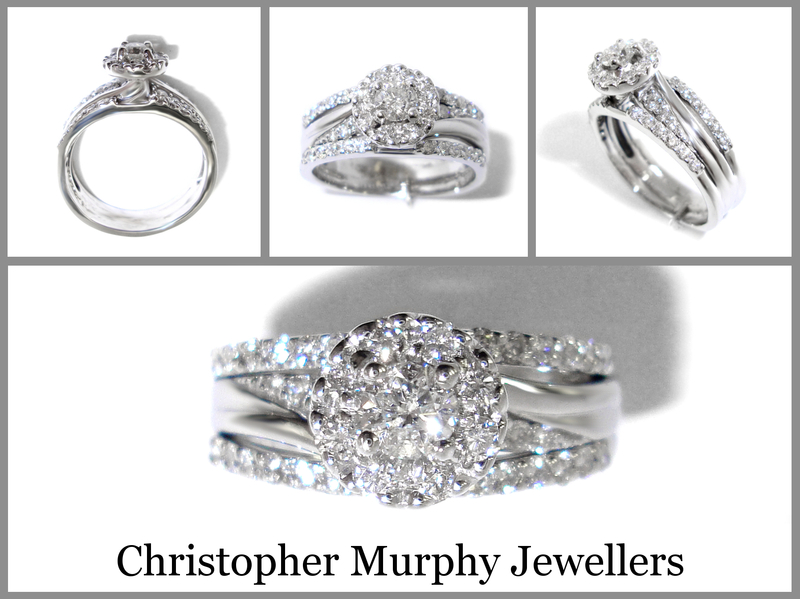 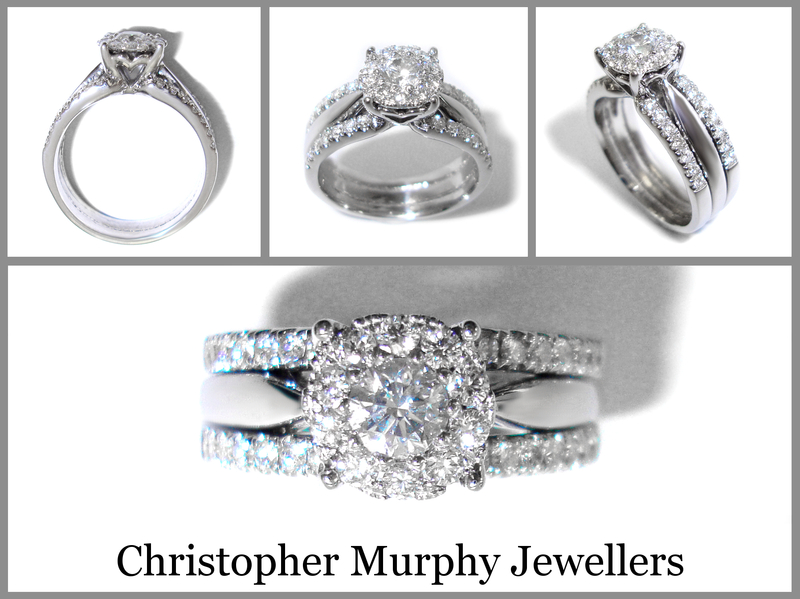 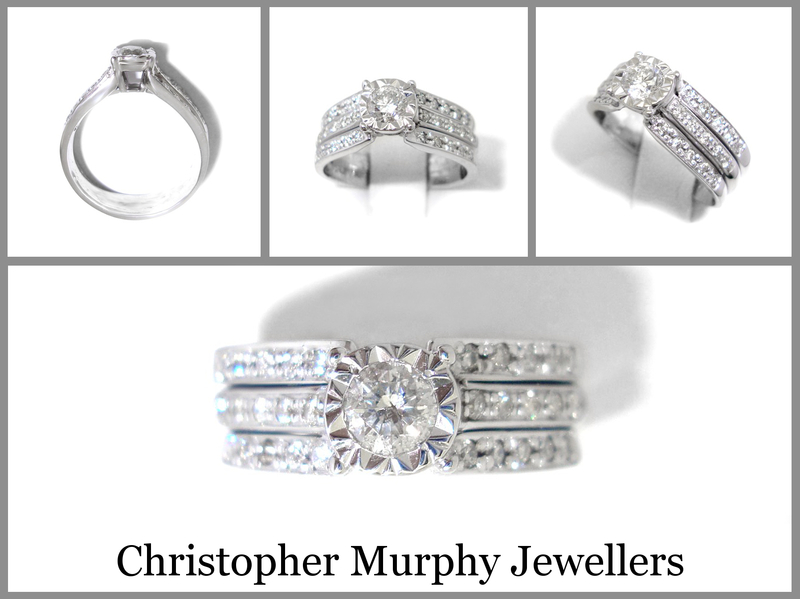 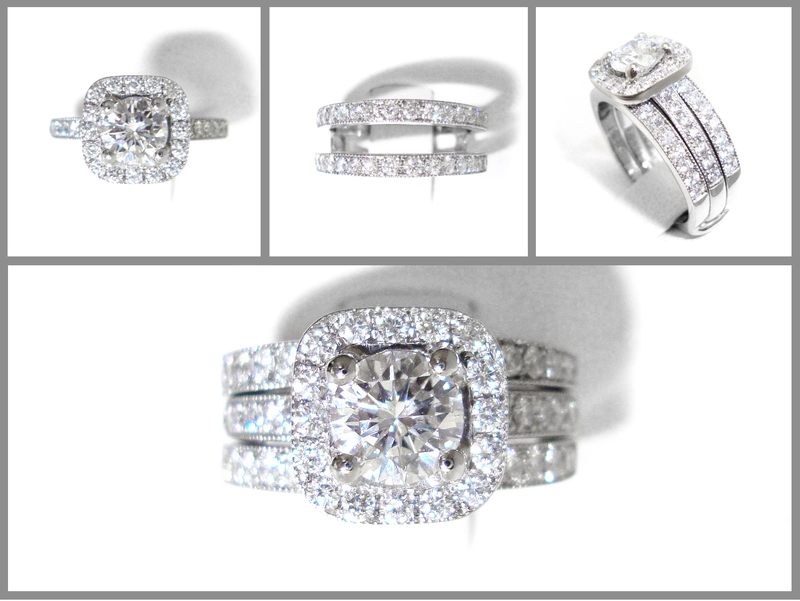 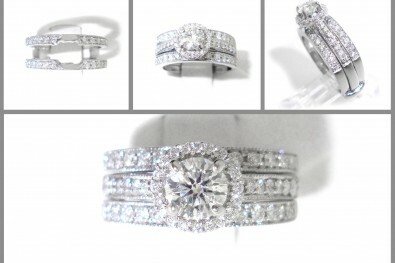 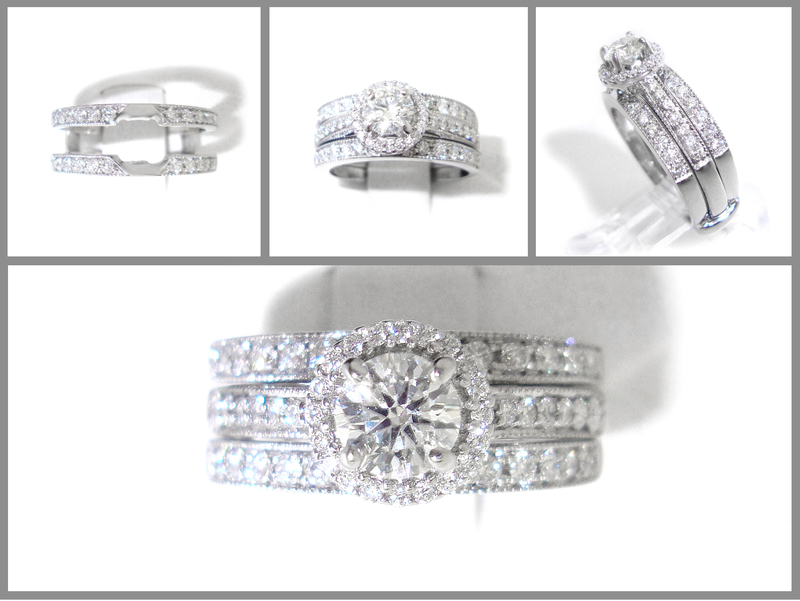 We Handcraft Each Wedding Ring To Match And Fit Snug With Your Engagement Ring. Your Ring Will Be Unique To You! 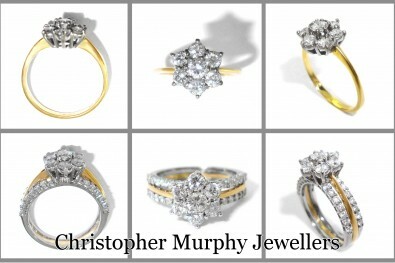 All ring prices are for 18ct gold.. 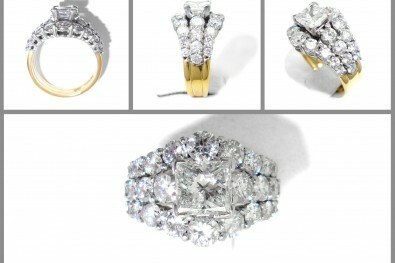 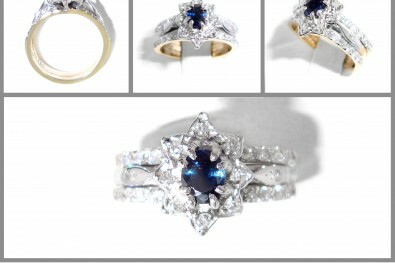 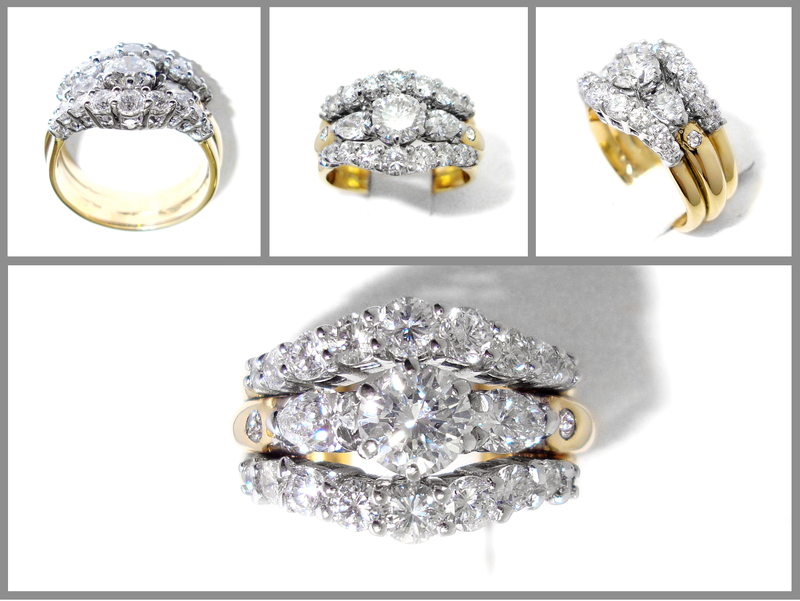 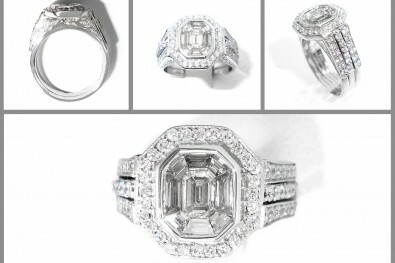 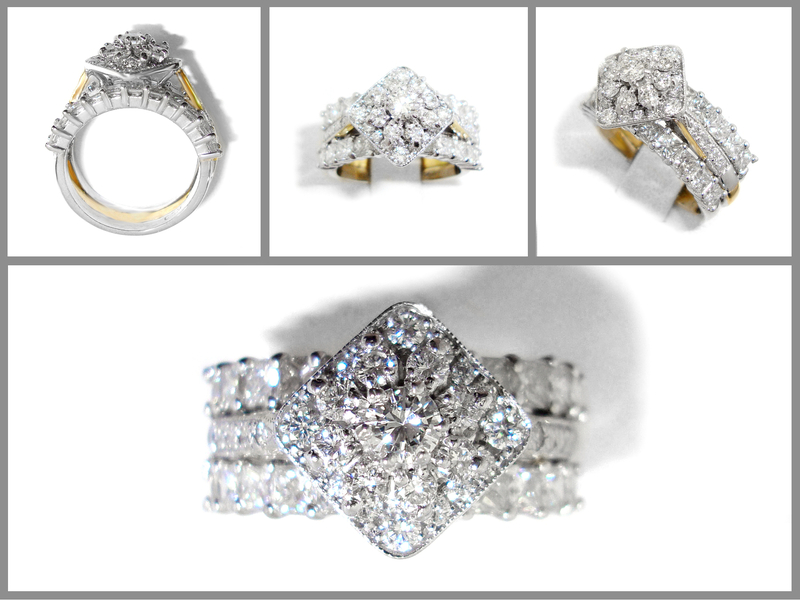 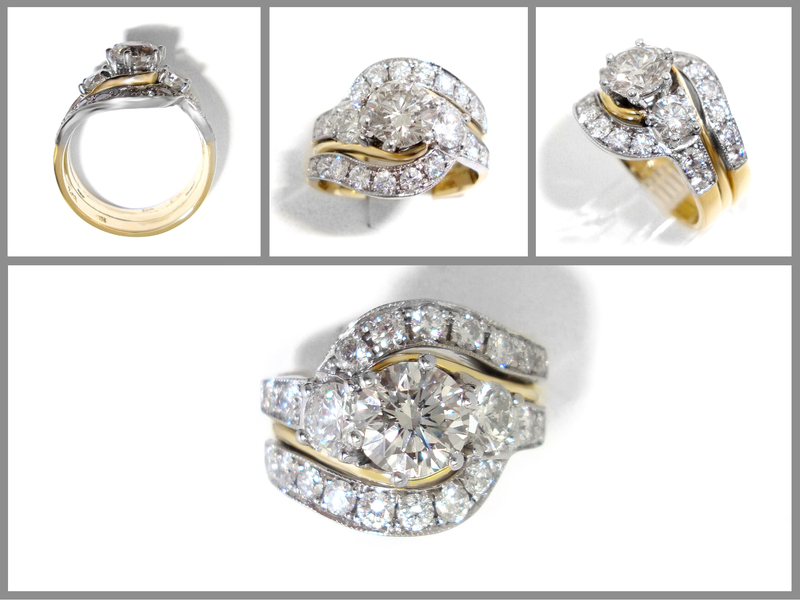 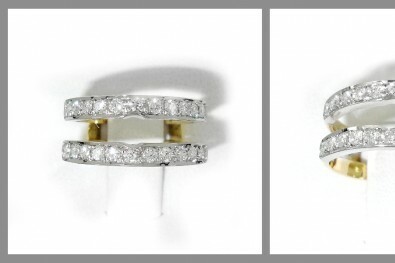 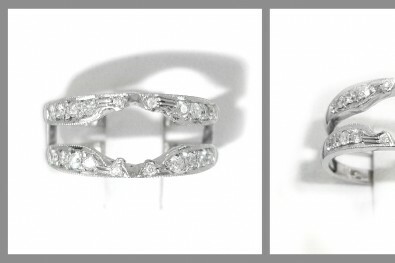 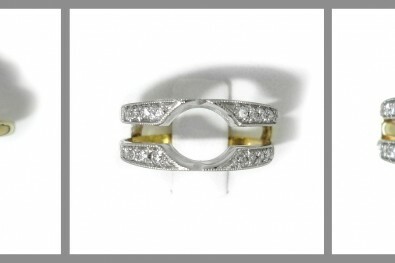 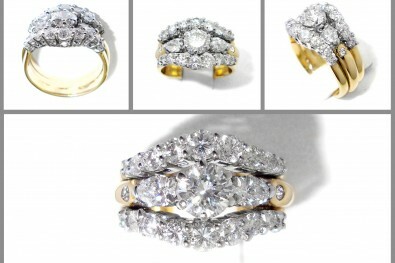 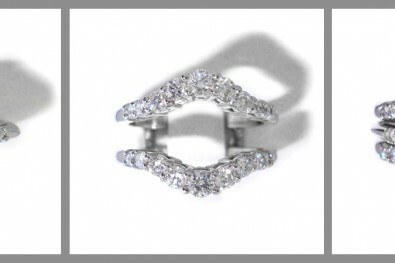 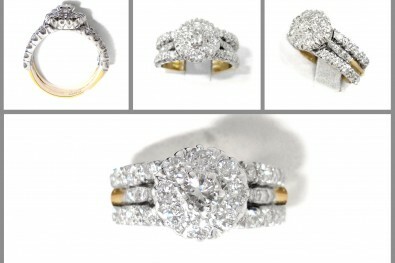 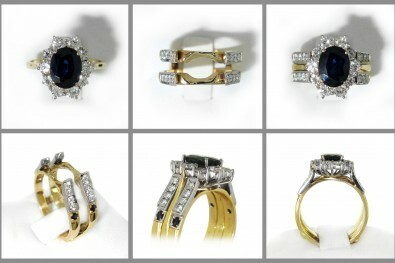 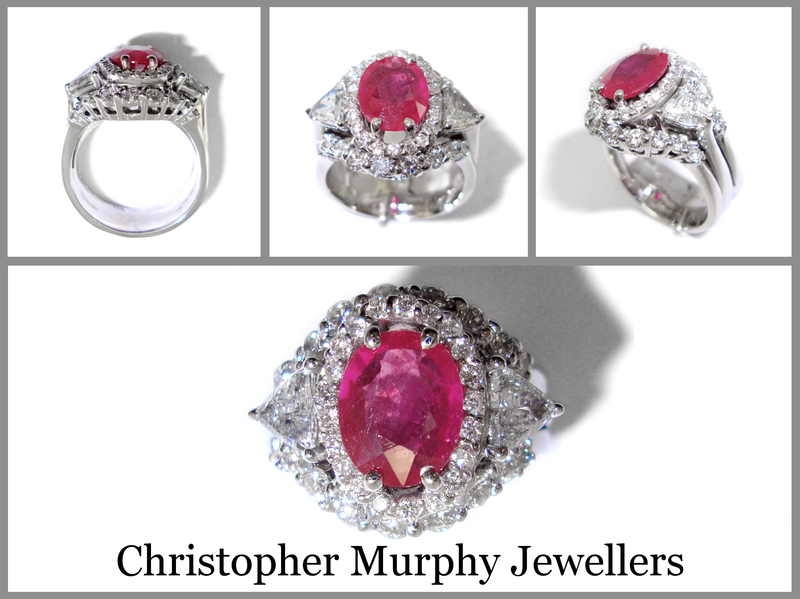 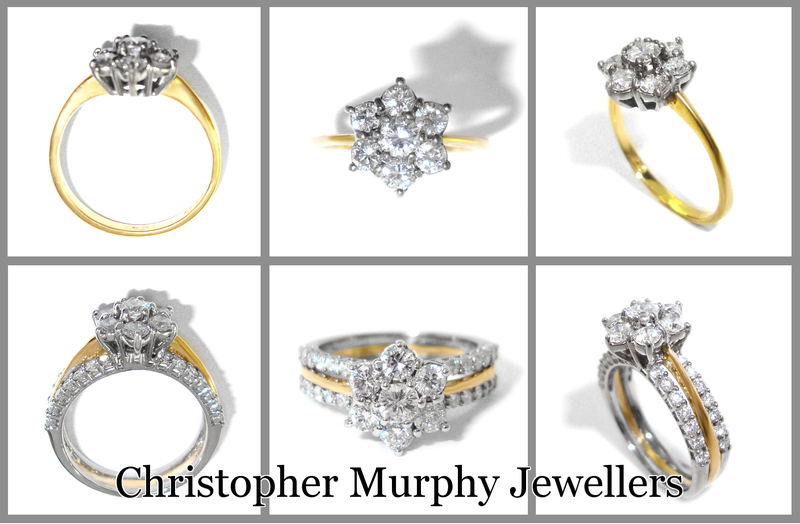 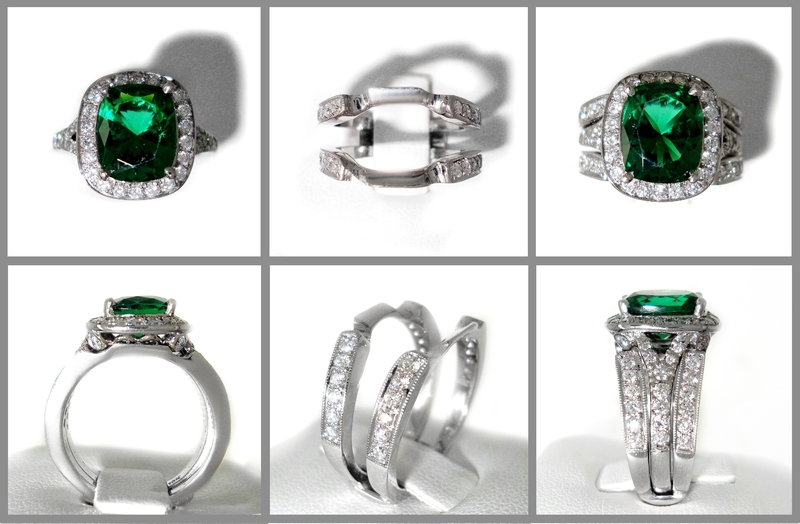 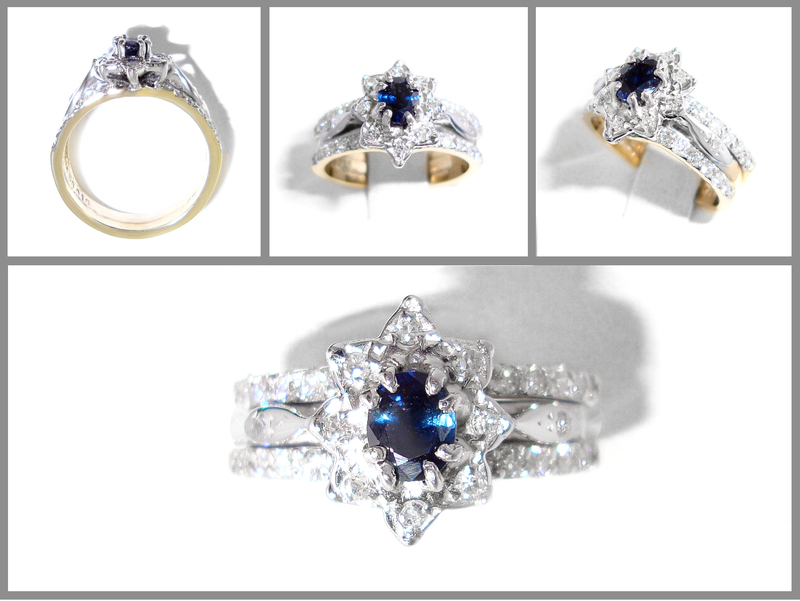 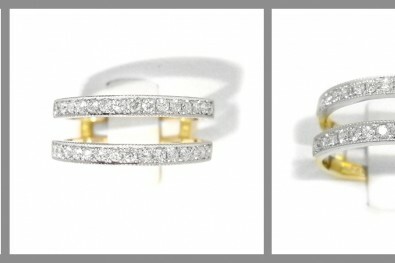 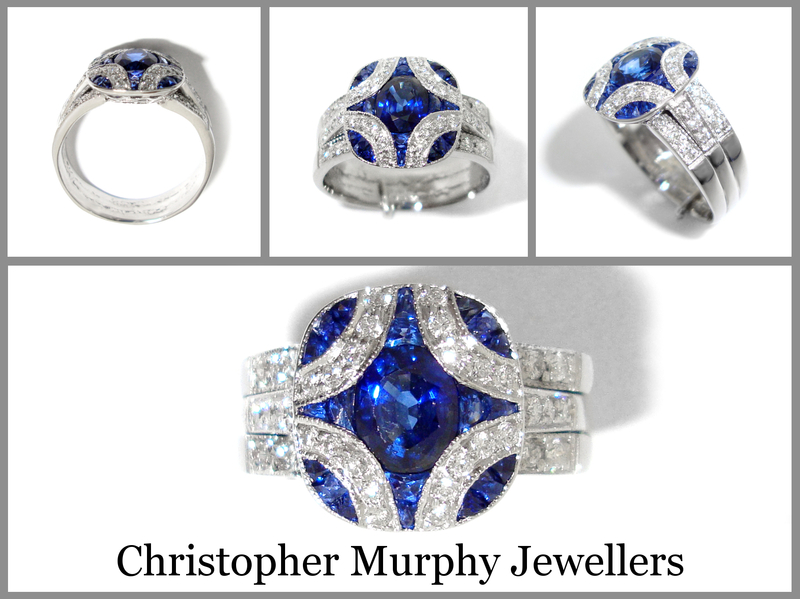 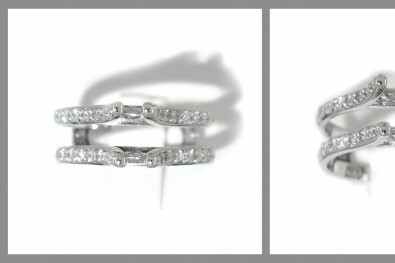 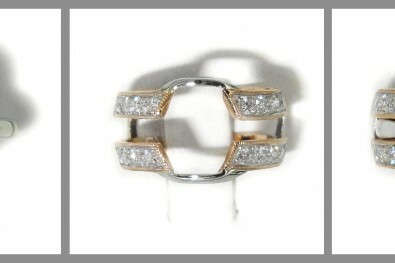 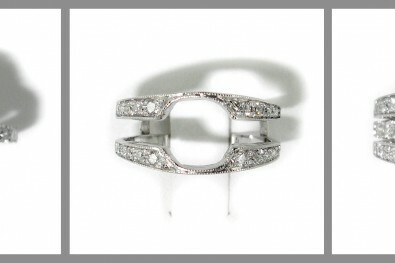 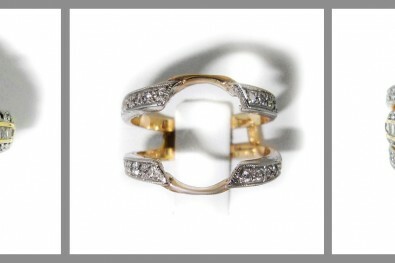 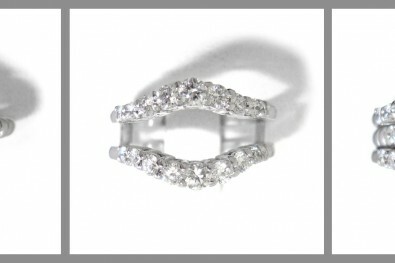 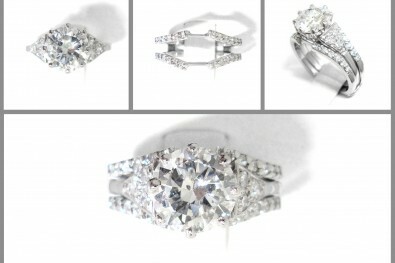 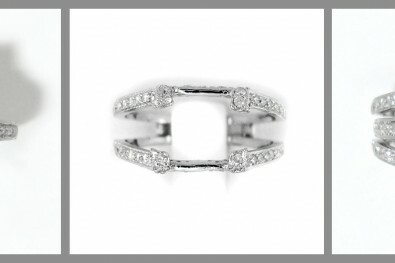 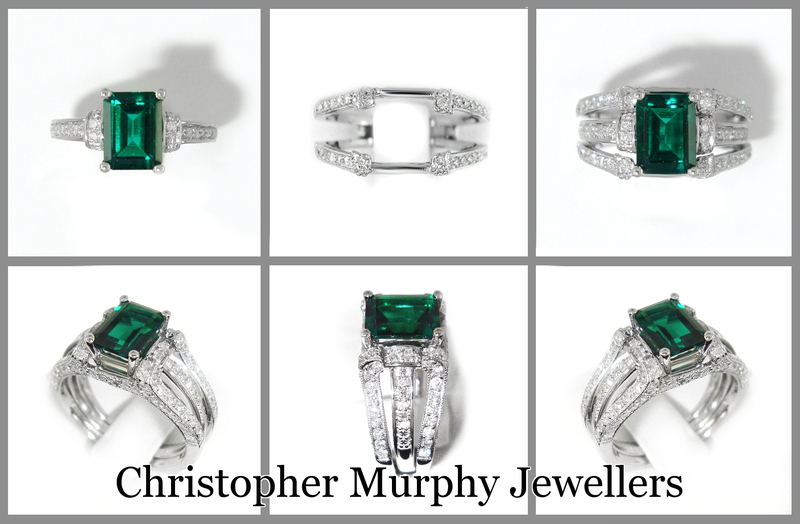 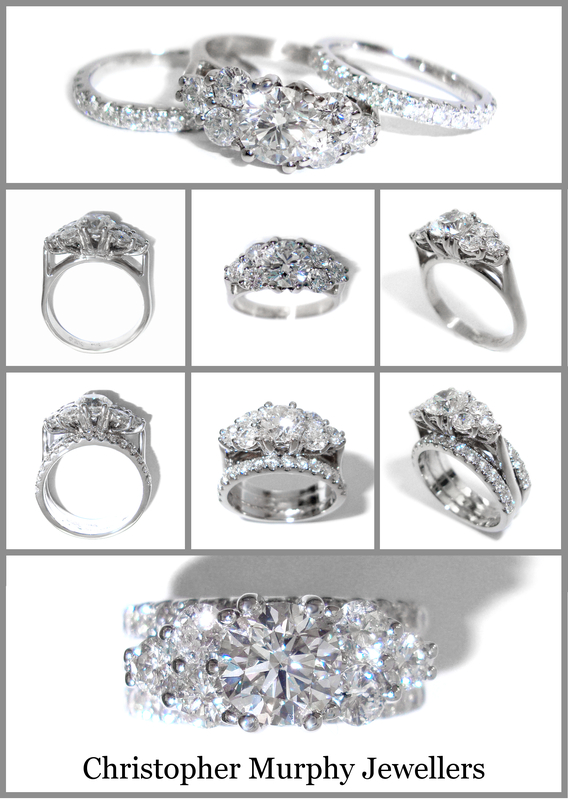 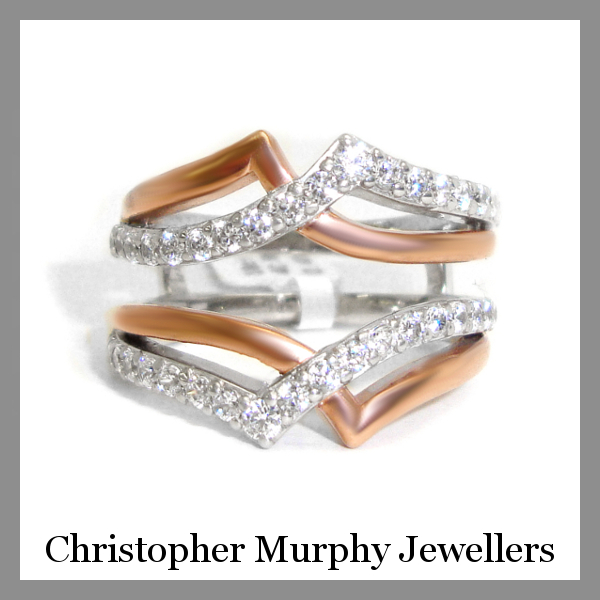 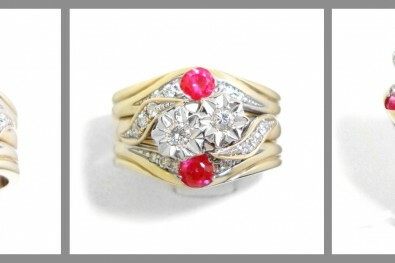 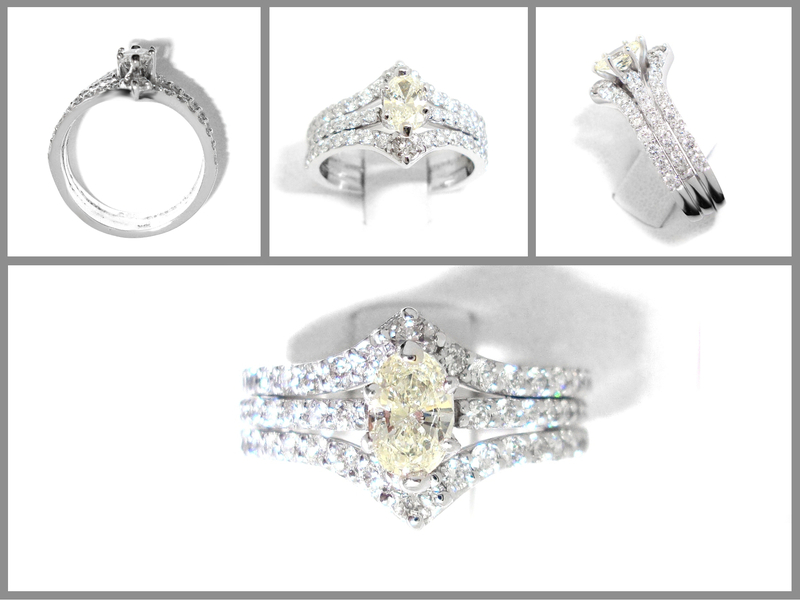 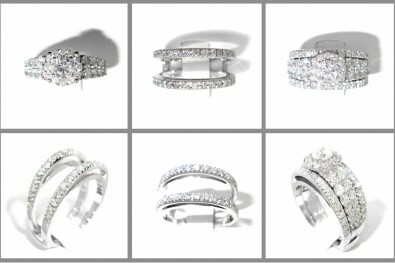 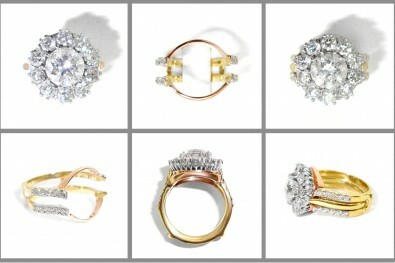 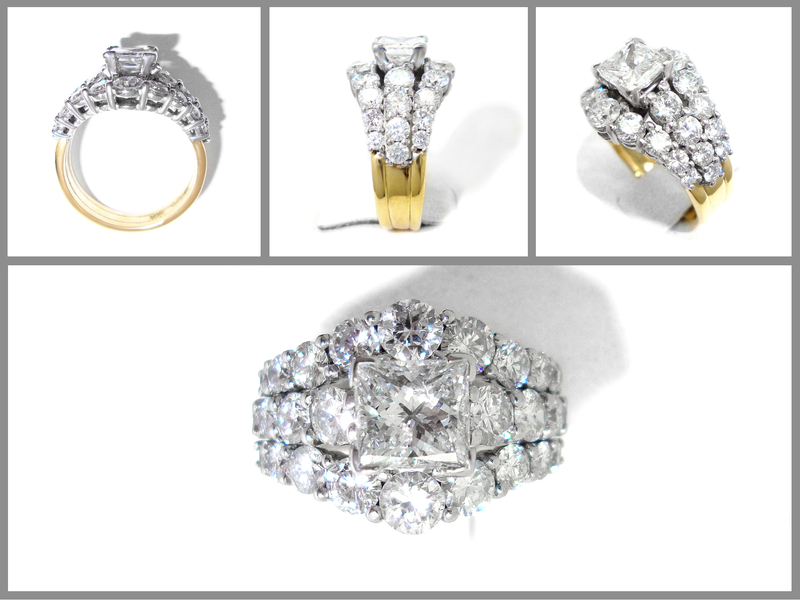 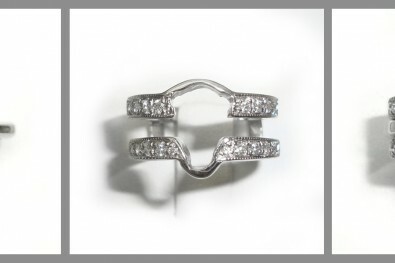 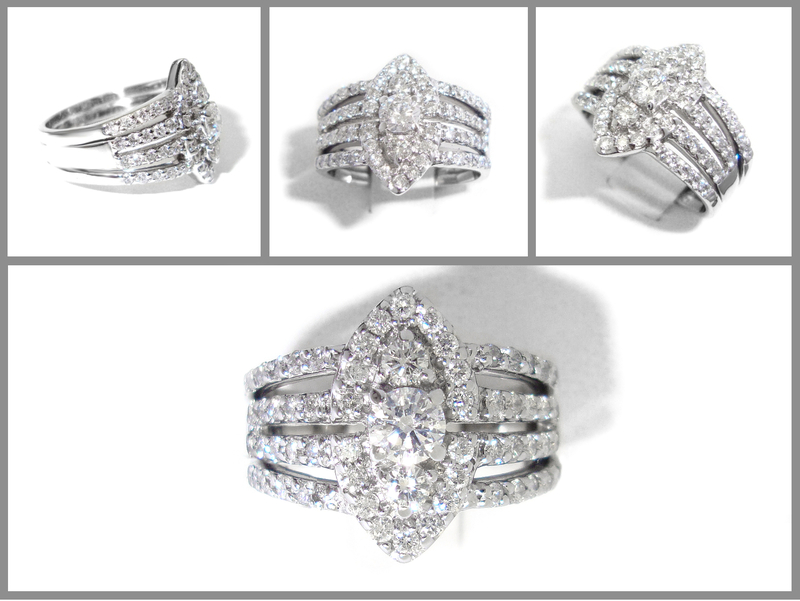 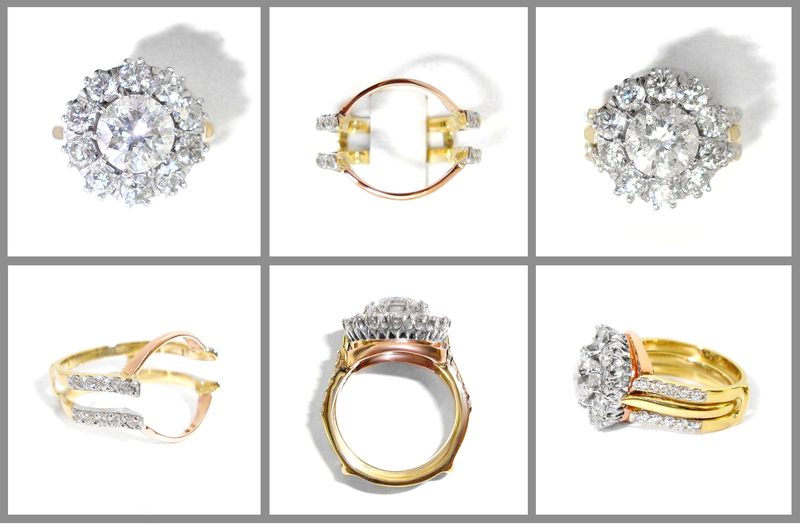 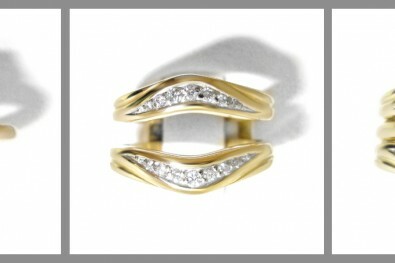 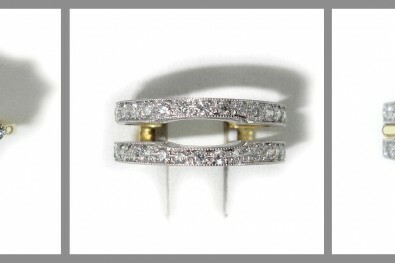 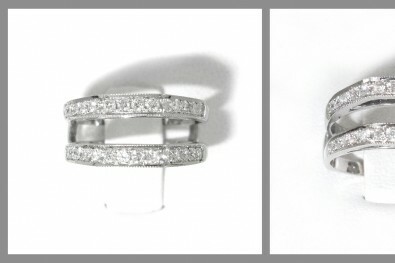 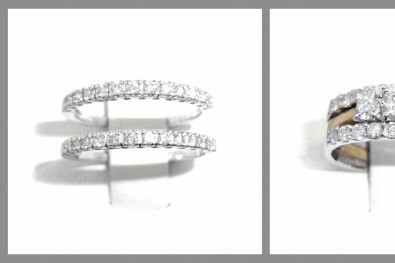 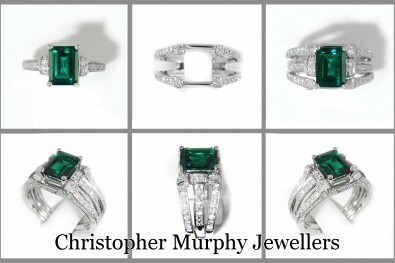 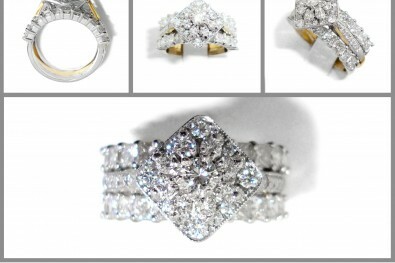 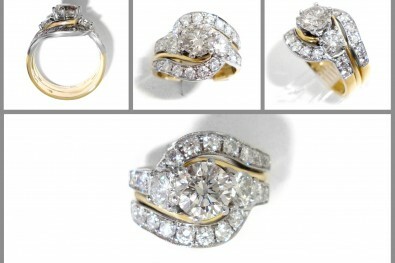 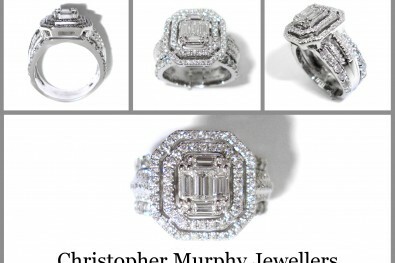 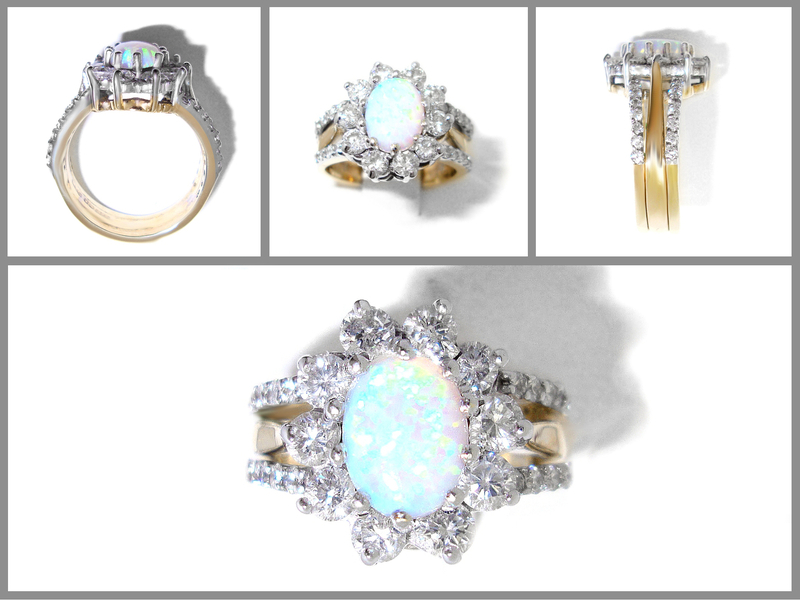 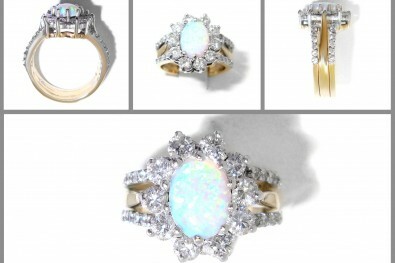 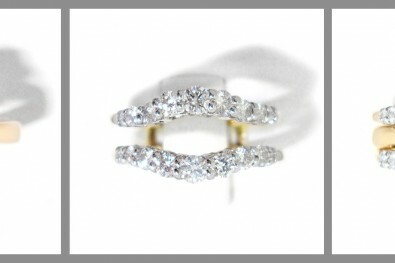 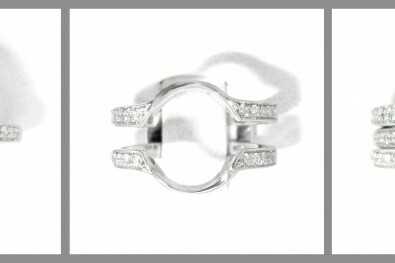 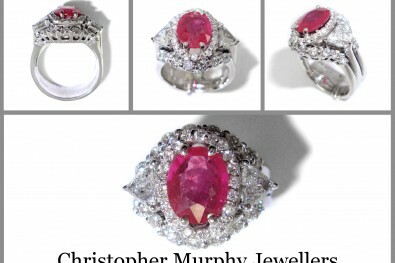 Rings can be made in 9ct, 14ct, 18ct Rose, White & Yellow Gold, Palladium & Platinum.